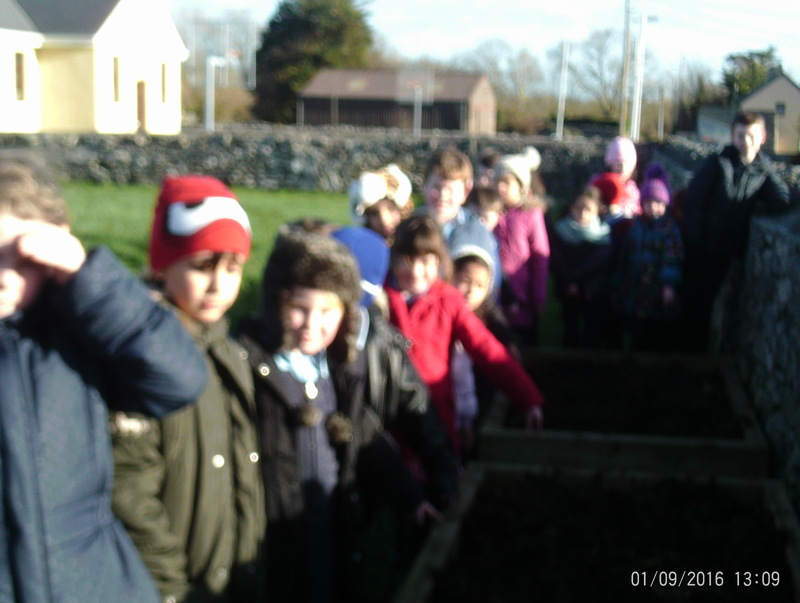 We went to Money Point on the 14th of February. 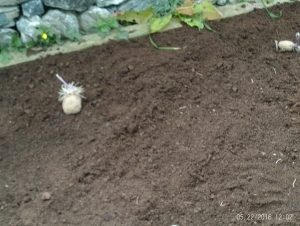 It took 40 minutes to get there. 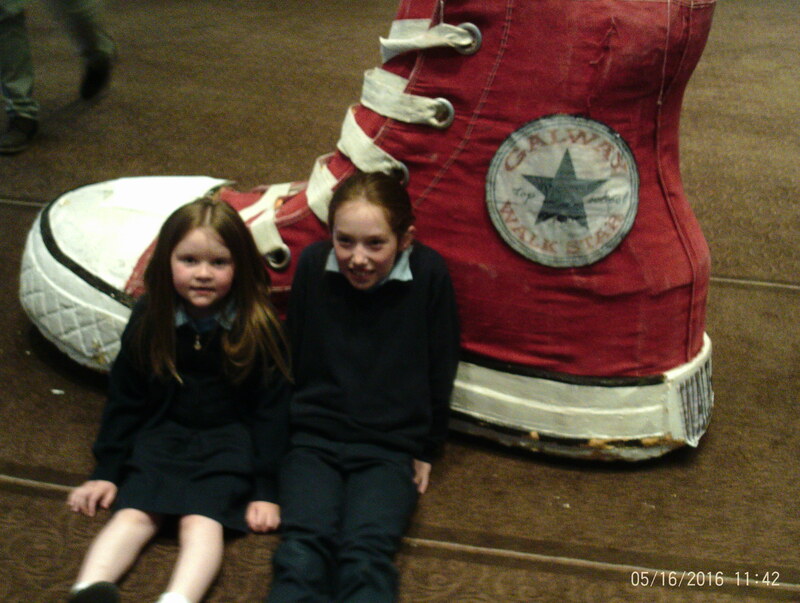 When we got there we went into the visitor centre. 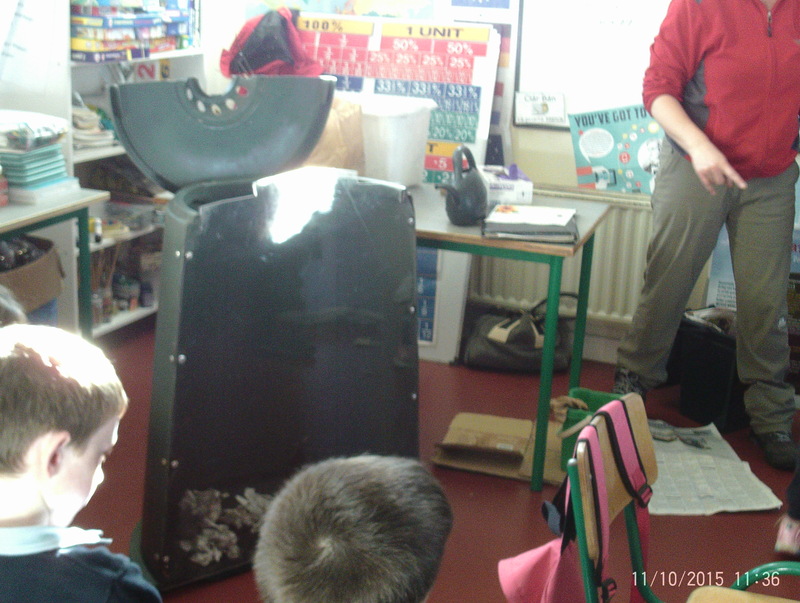 There was a big model of Money Point. 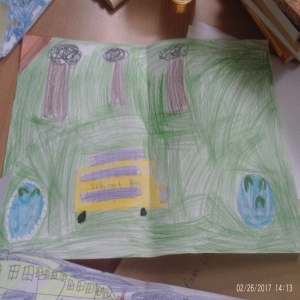 After that we went around the working area on the bus, the man who works there showed us all around. 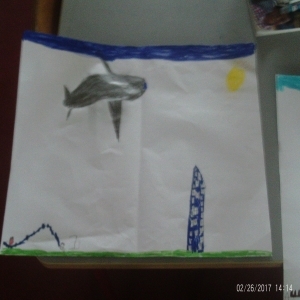 There were 5 wind turbines in Money Point. 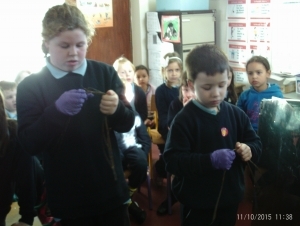 We learned a lot about it. In there they have 47 computers in one of the rooms plus the white boards (we counted them) that’s where they can see what’s around the whole Ireland. 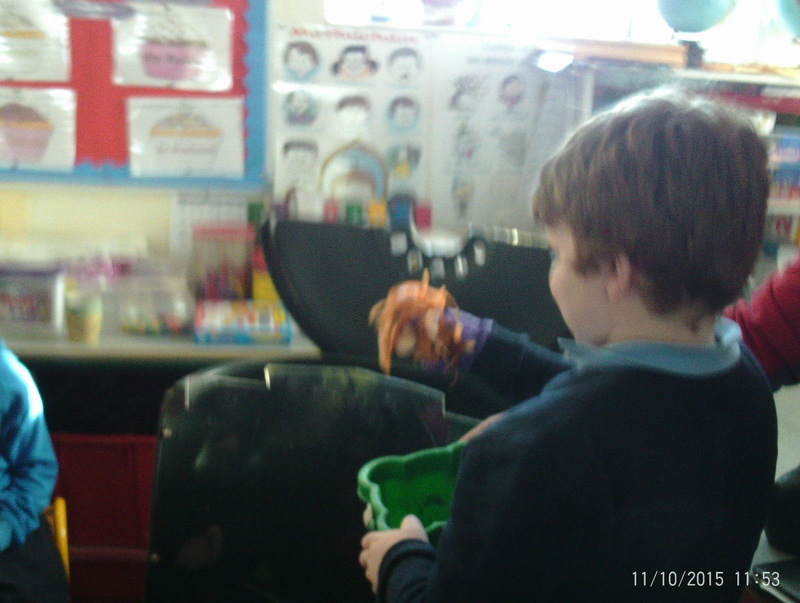 We saw lots of workers around the area. 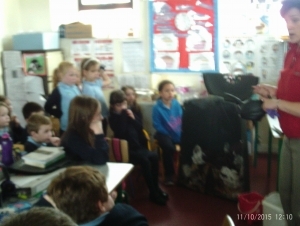 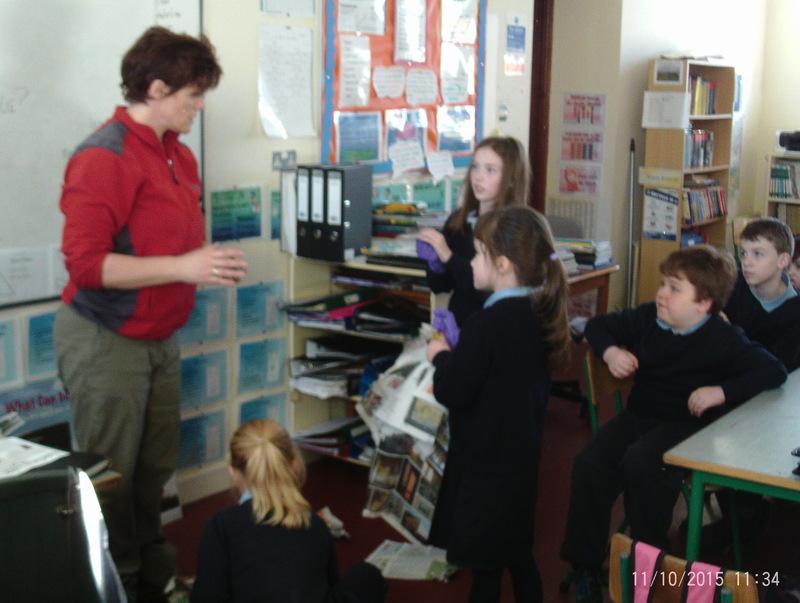 Joan Tarmey came in to talk to us about water. 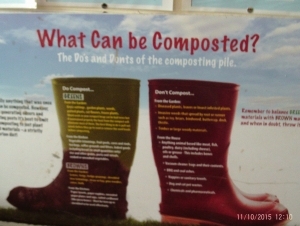 She said that everything you flush down the toilet and send down the sinks, showers, washing machine and dishwasher ends up in your septic tank system. 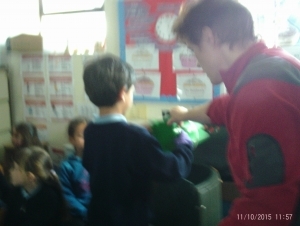 And waste water flows from the house to the septic tank. 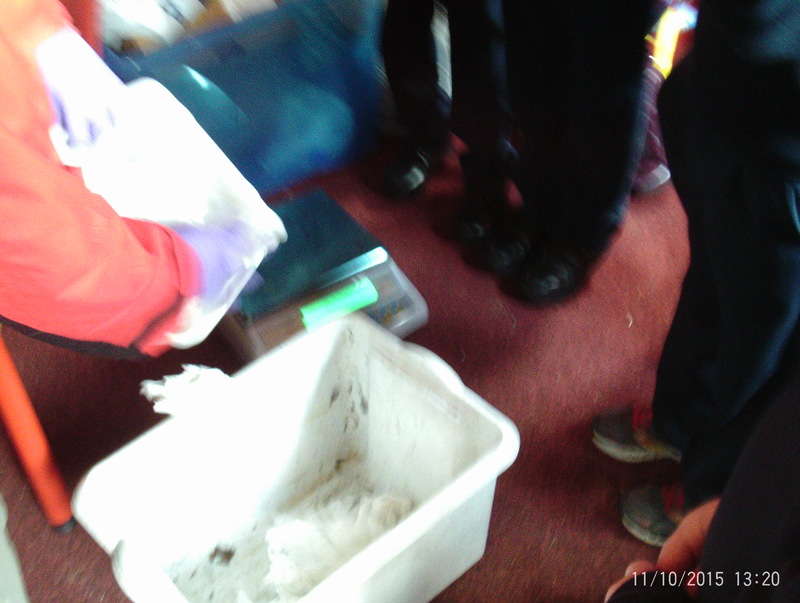 The solids and scum form sludge in the tank and that needs to be removed regularly. 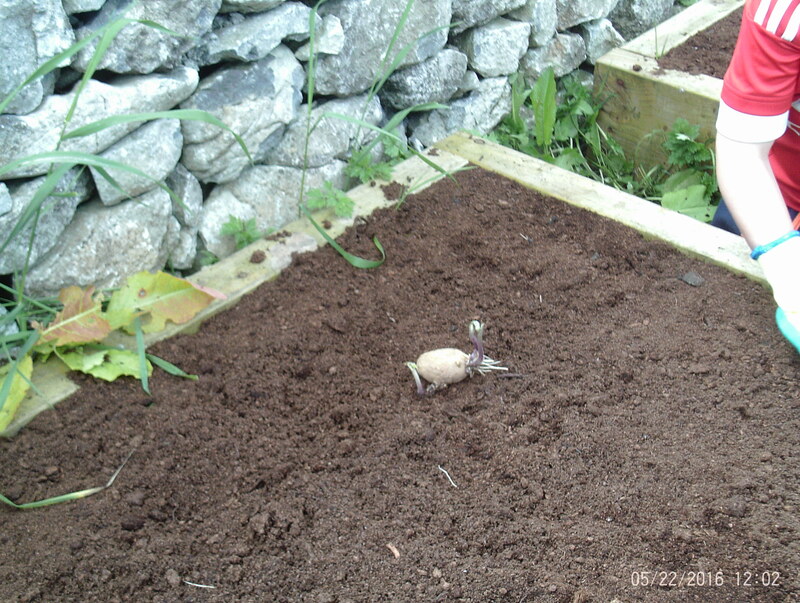 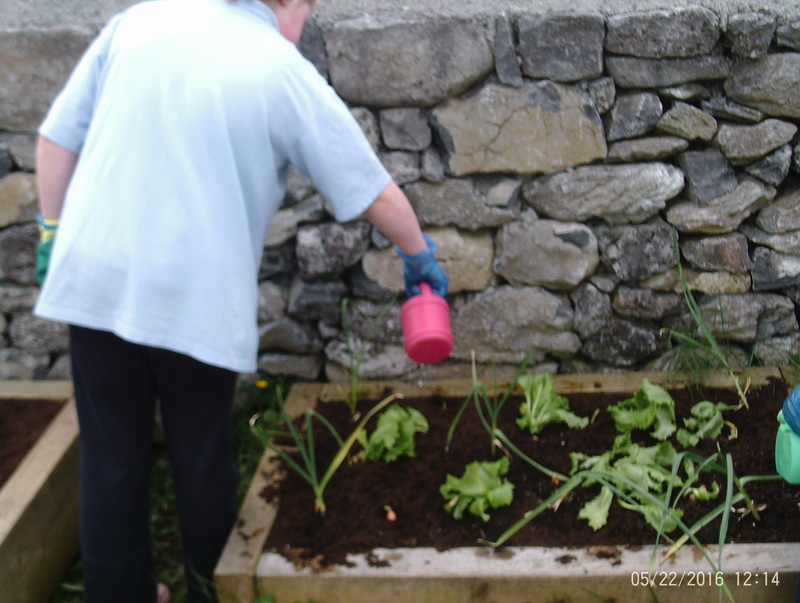 Liquid effluent percolates down the pipes through the soil in your garden. 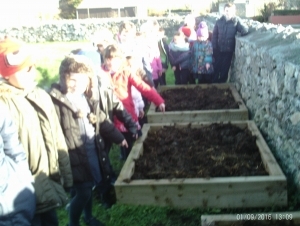 The soil is where most of the treatment takes places as it helps filter out the bacteria before making it way to the bedrock below. 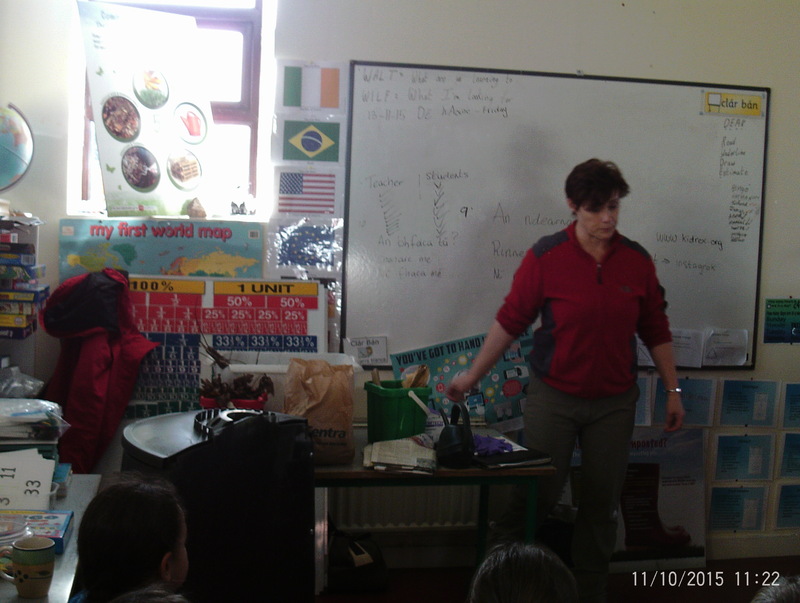 Áine came to our school on the 14th of November of 2017. 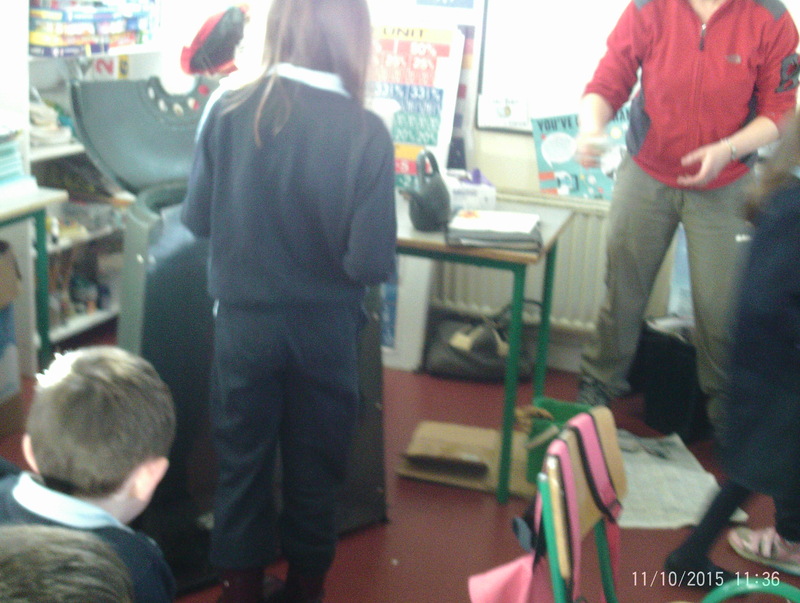 Áine came in and talked to us about saving energy. We did lots of fun science experiments with her. 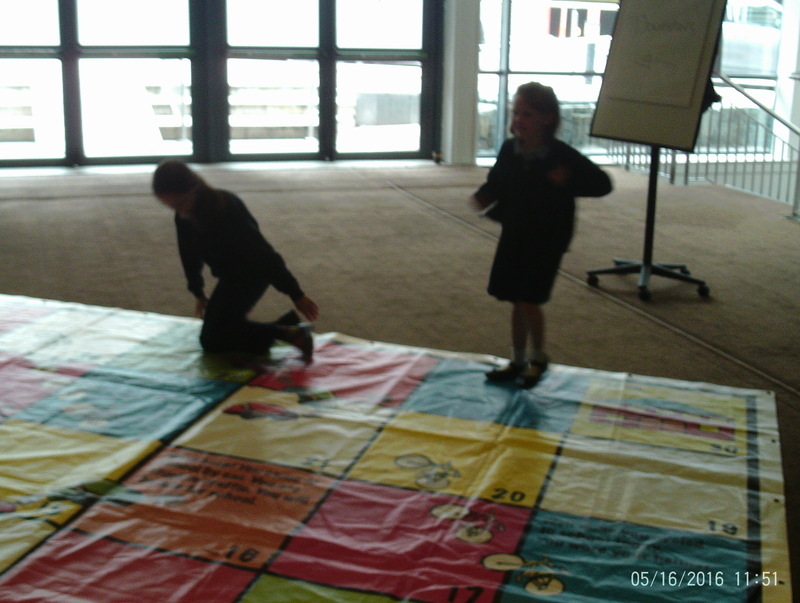 We played an energy game they separated us into 4 groups yellow, green, blue and red. Yellow and green drew! 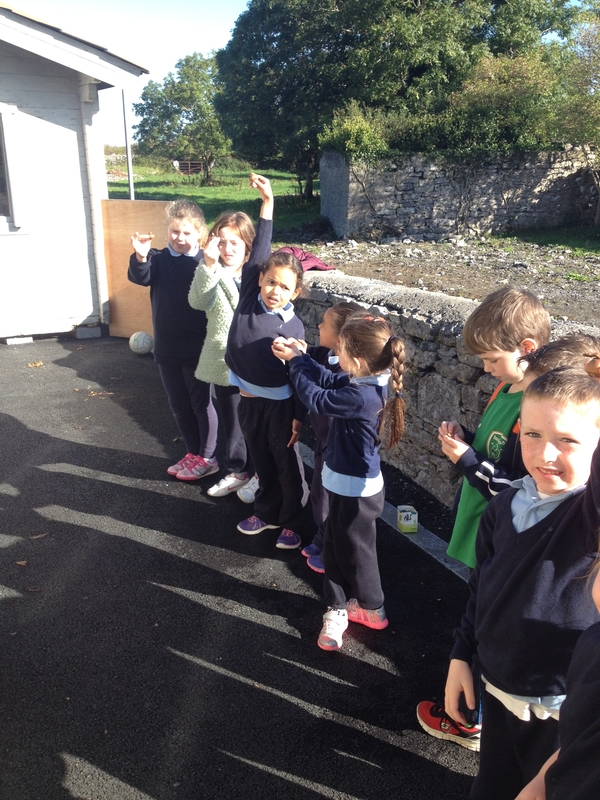 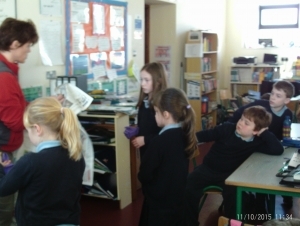 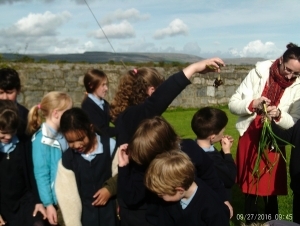 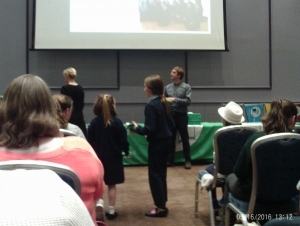 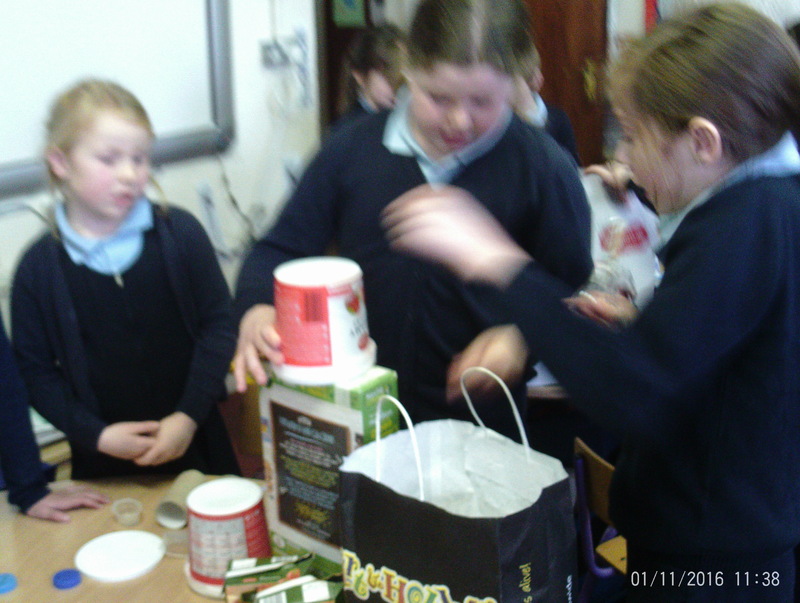 Áine talked about renewable energy and non-renewable energy. 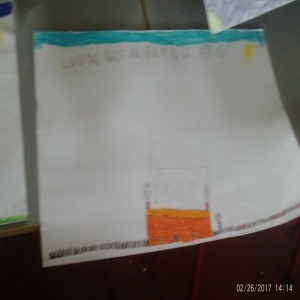 We learned that this causes carbon dioxide. We had lots of fun. 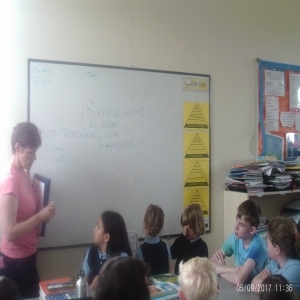 Thank you to one of our parents Joan Tarmey for coming in to talk to the children all about renewable and non-renewable energy. 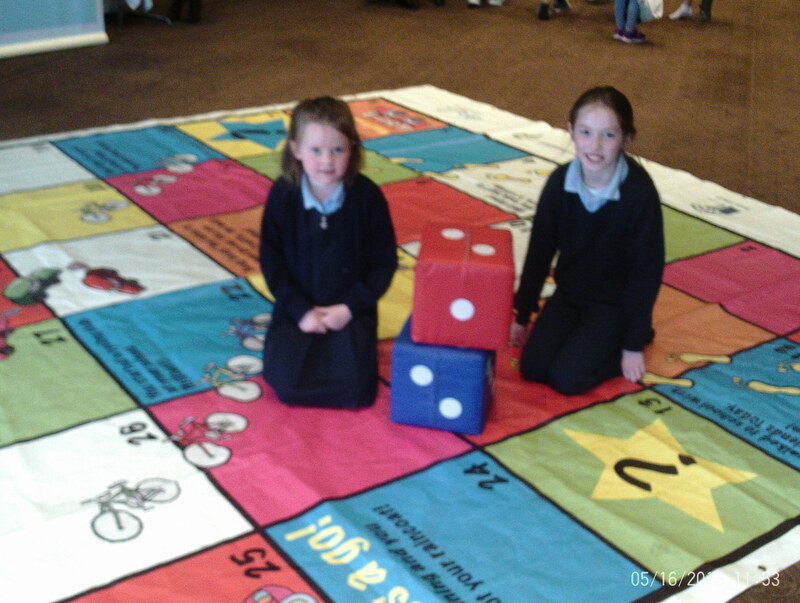 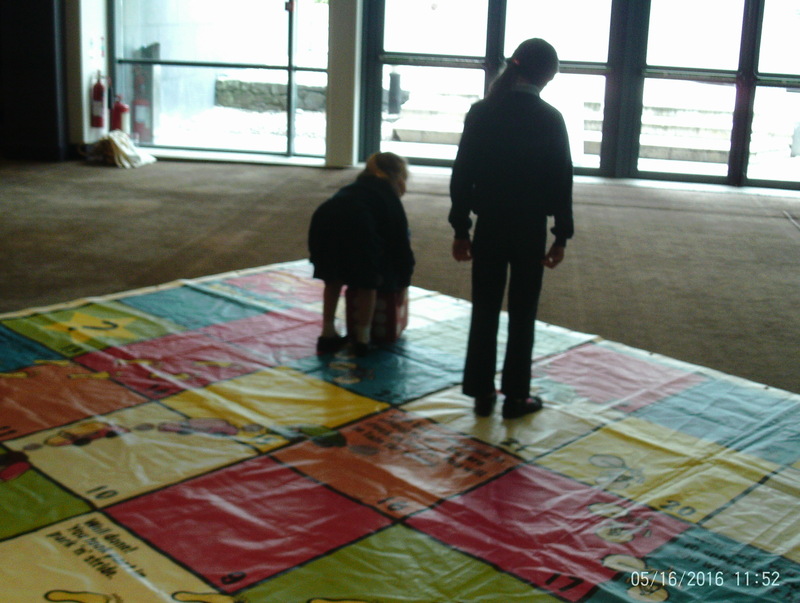 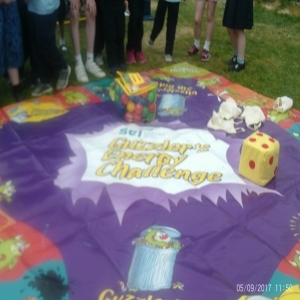 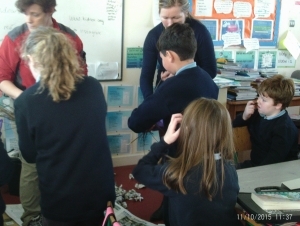 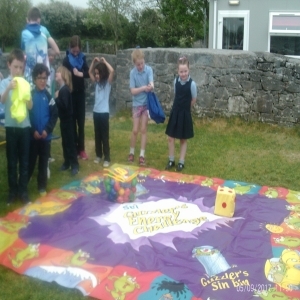 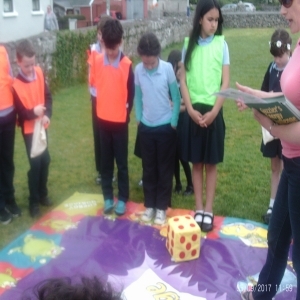 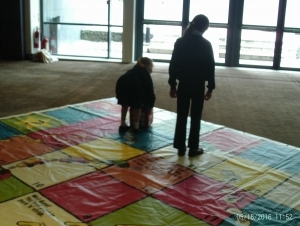 The whole school then got the chance to participate in a floor board game ‘Guzzler’s Energy Challenge’ where they learned lots more about Energy. 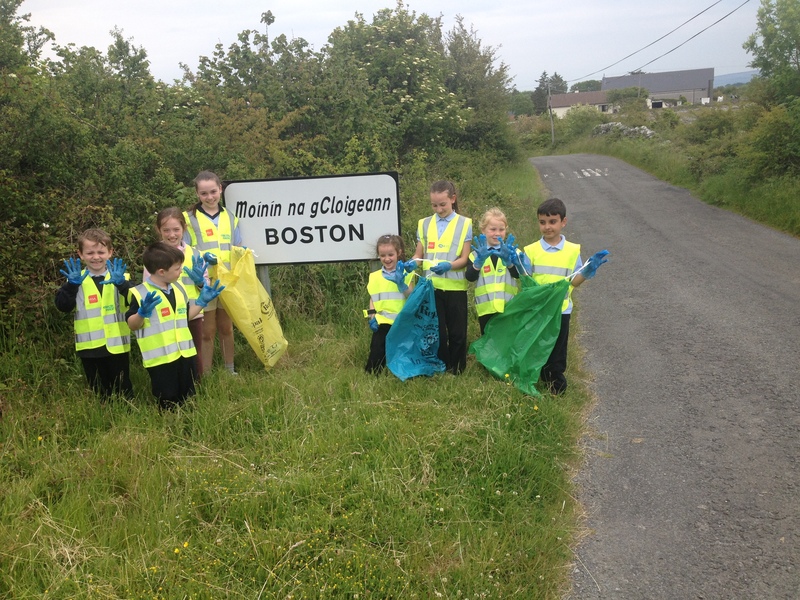 Well done to all the boys and girls in Boston N.S. 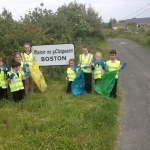 for taking part in the An Taisce Clean up to keep our area in Boston NS litter free. 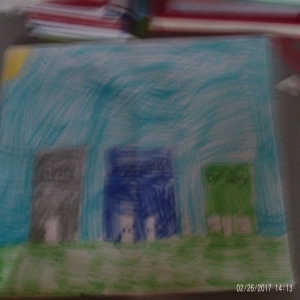 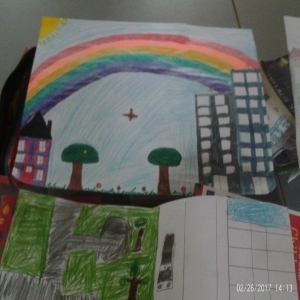 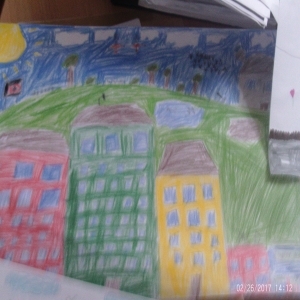 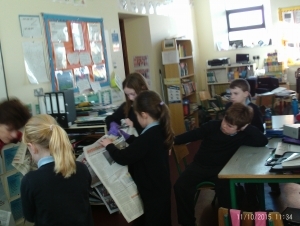 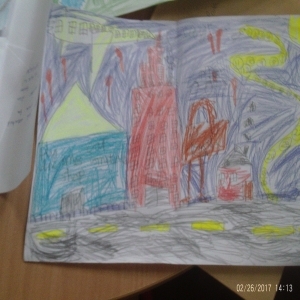 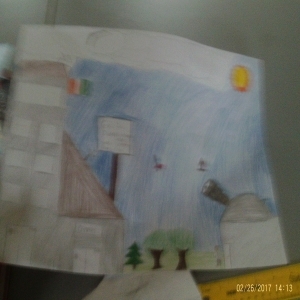 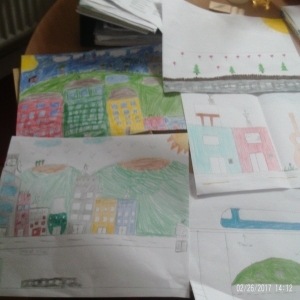 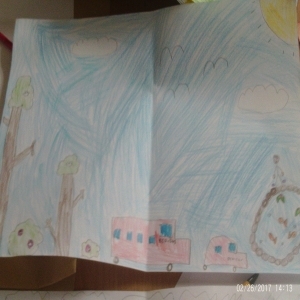 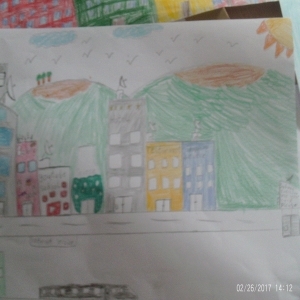 The children have been busy creating A3 posters which show how they would like Ireland to look in the future 2040. 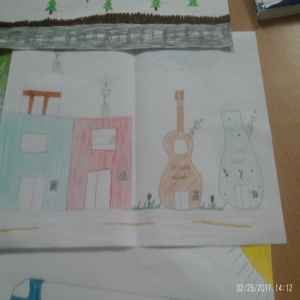 For example: should it include parks and open space, good public transport, smart cities, inclusive communities etc. 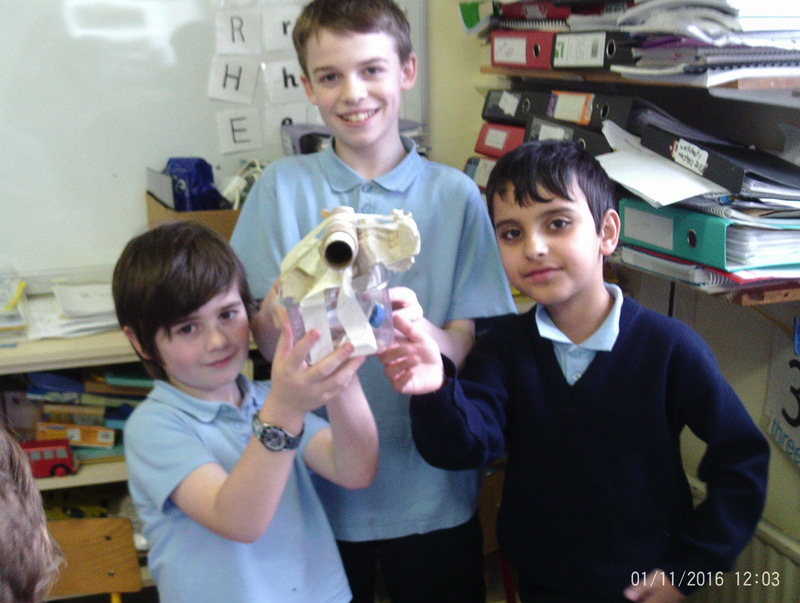 The children worked really hard and designed some beautiful, imaginative worlds. 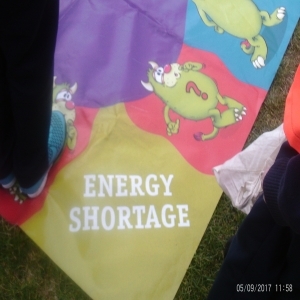 The children have been working really hard on coming up with a new slogan for our Energy Flag. 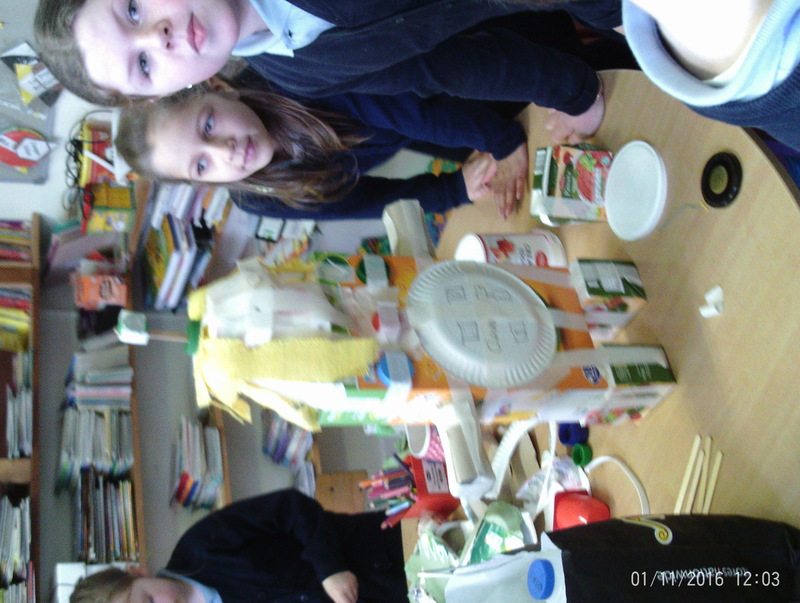 The children put a lot of thought and work into their ideas. A whole school vote was had during our Green School Meeting and the winning Slogan was written by Saoirse in 3rd class. 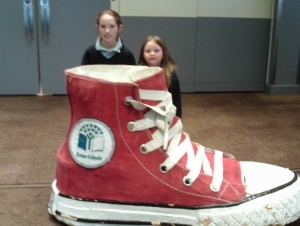 Boston N.S. 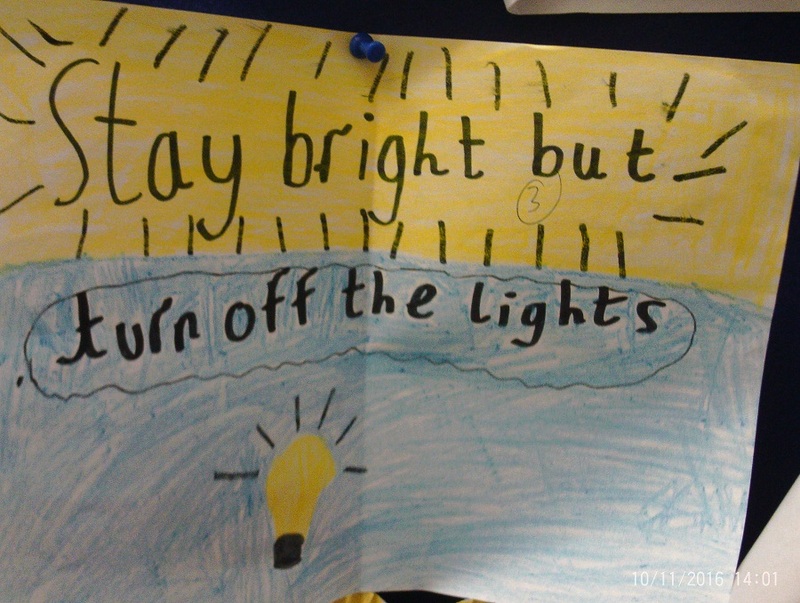 new Energy Slogan is ‘Stay Bright but Turn off the Lights’. 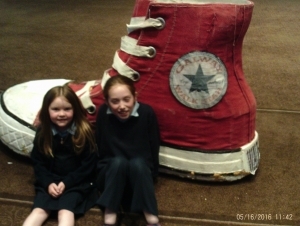 The children in Boston N.S. were busy harvesting this week and brought home some lovely onions for their families. 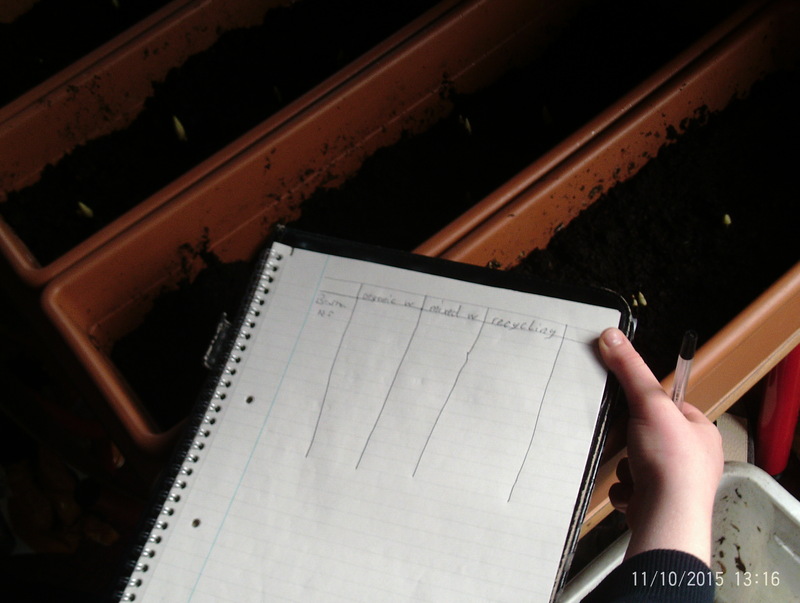 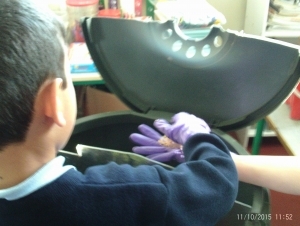 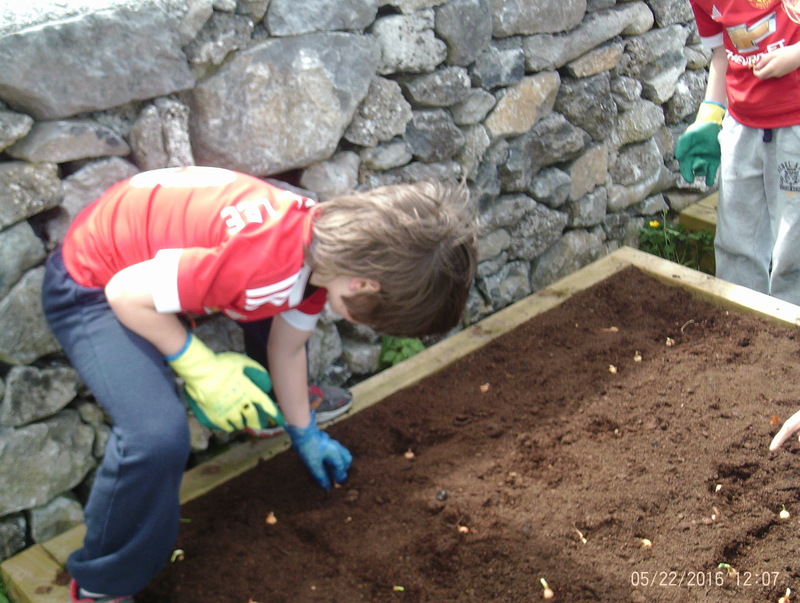 The children are continuing to work really hard at being a Green School. 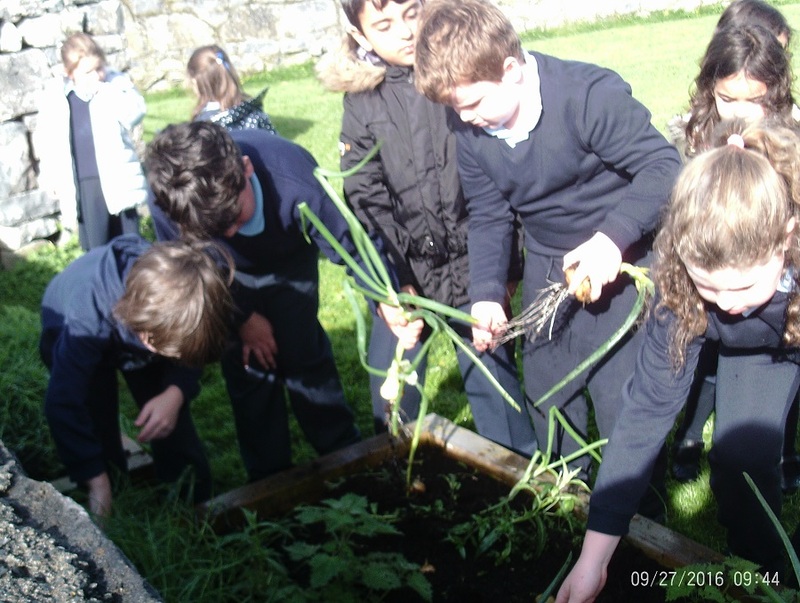 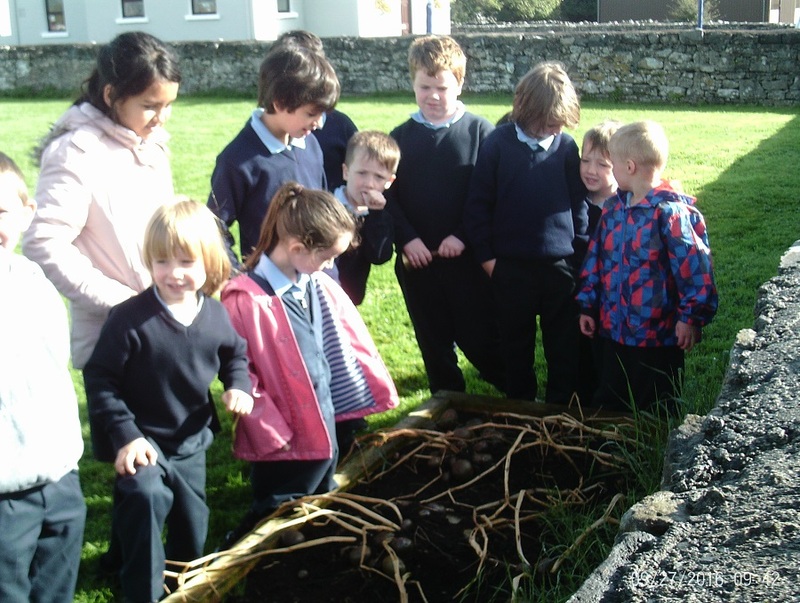 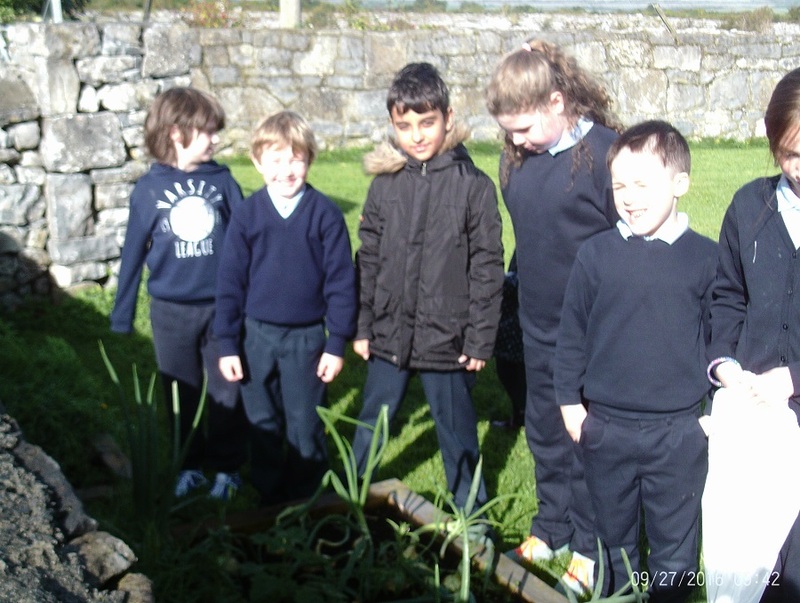 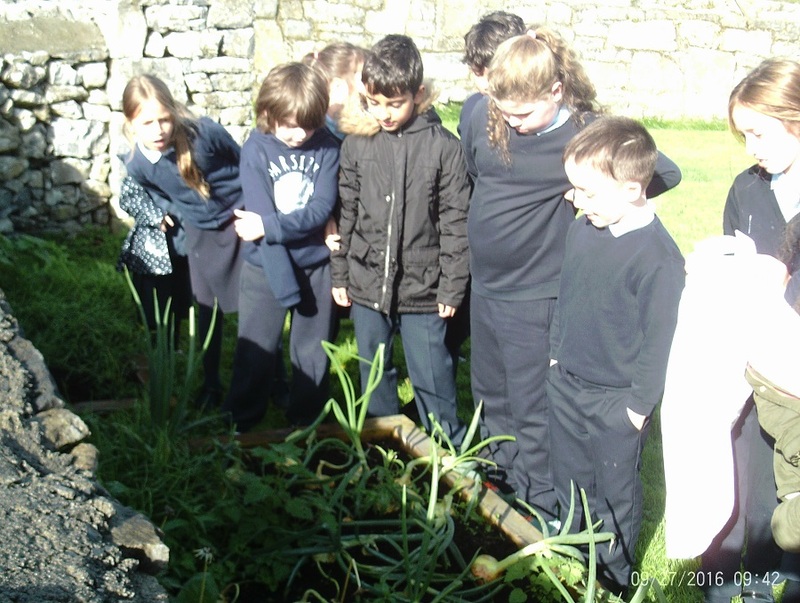 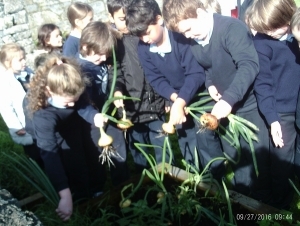 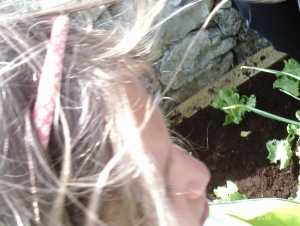 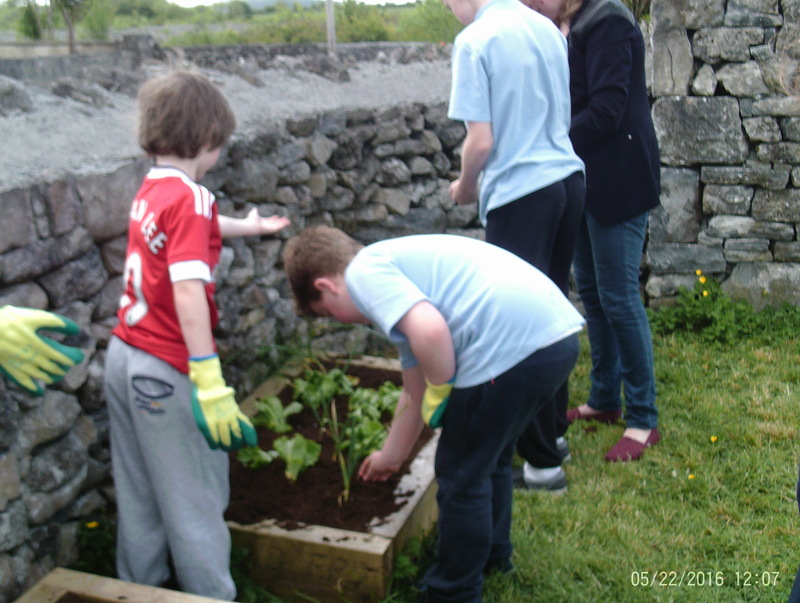 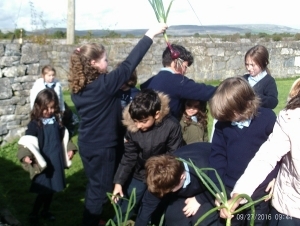 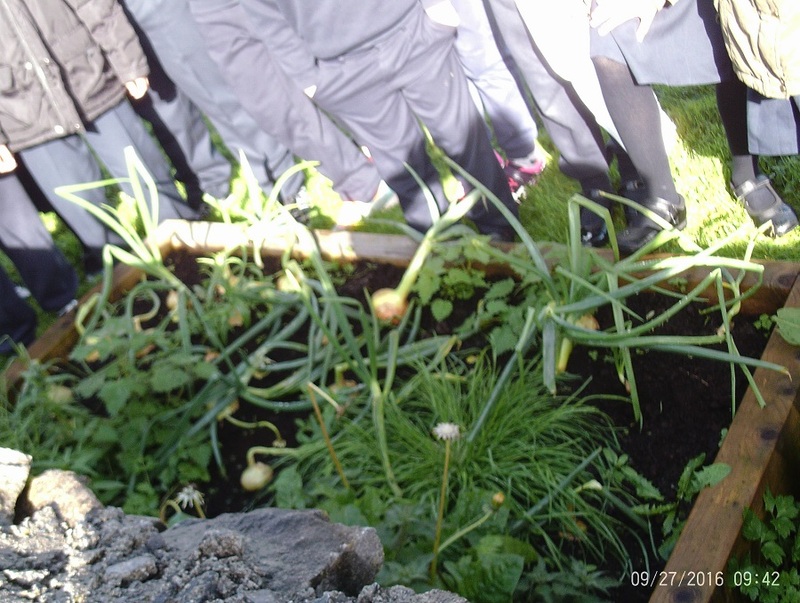 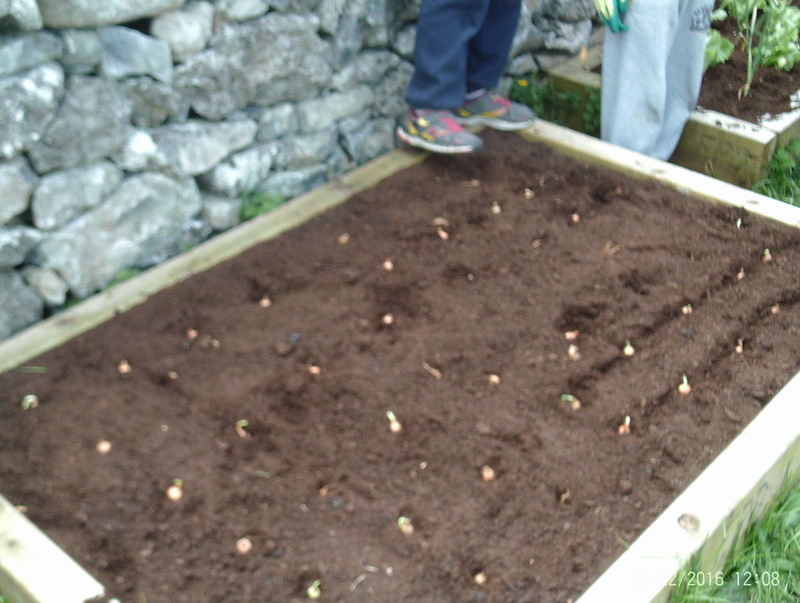 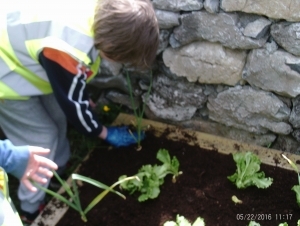 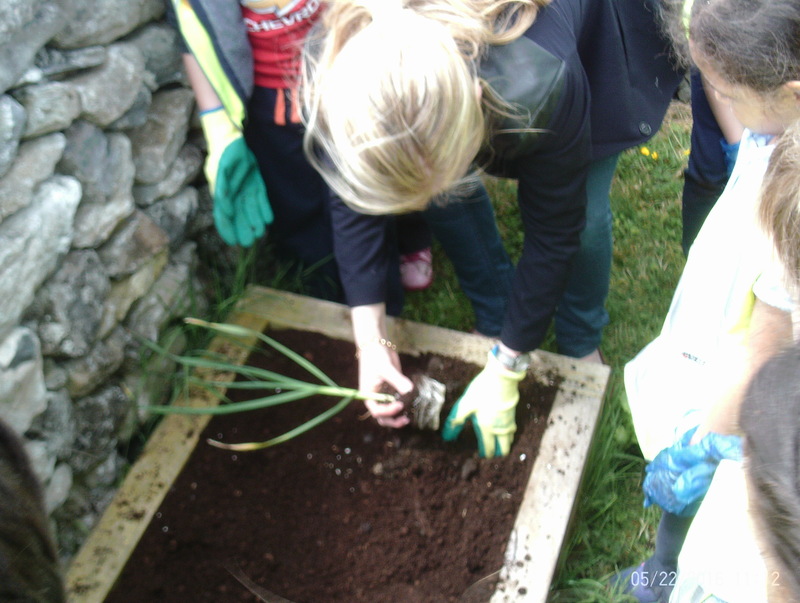 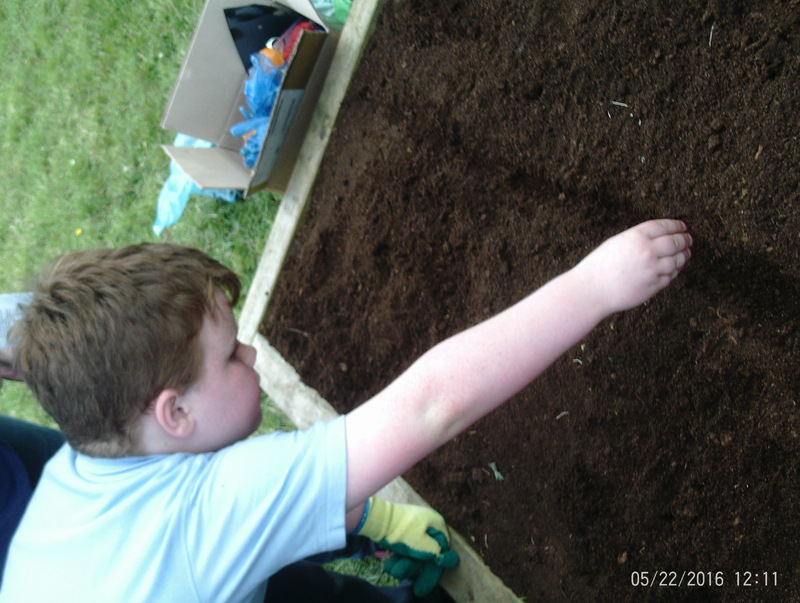 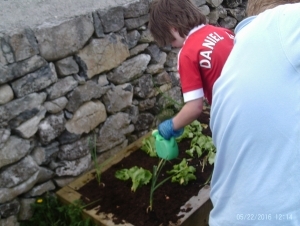 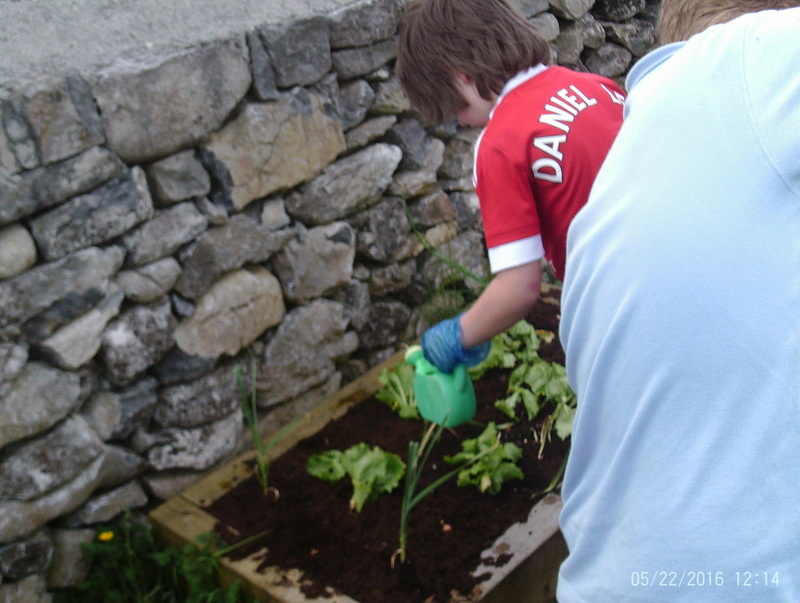 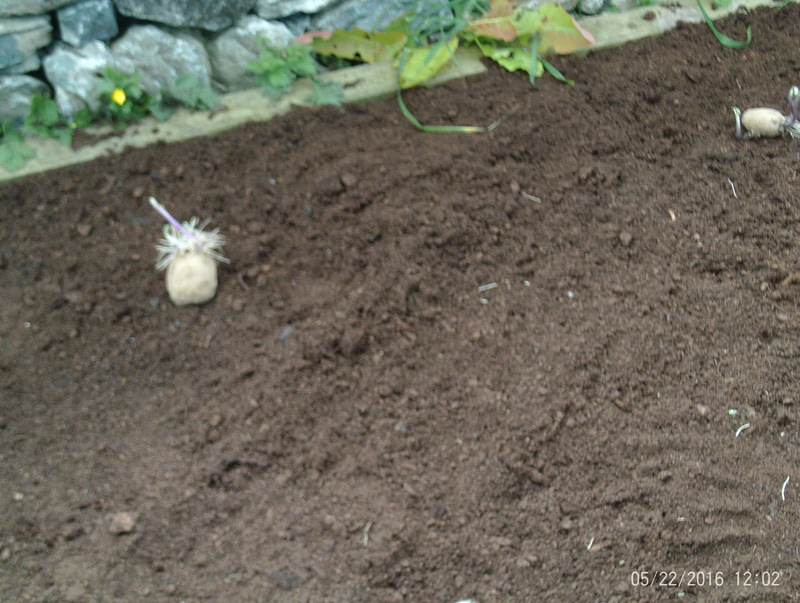 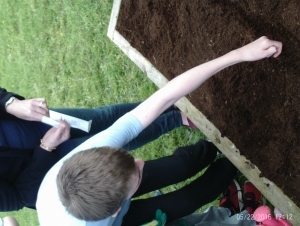 The children planted lots of vegetables such as spuds, onions, turnips, garlic and lettuce in flower beds in the school green. 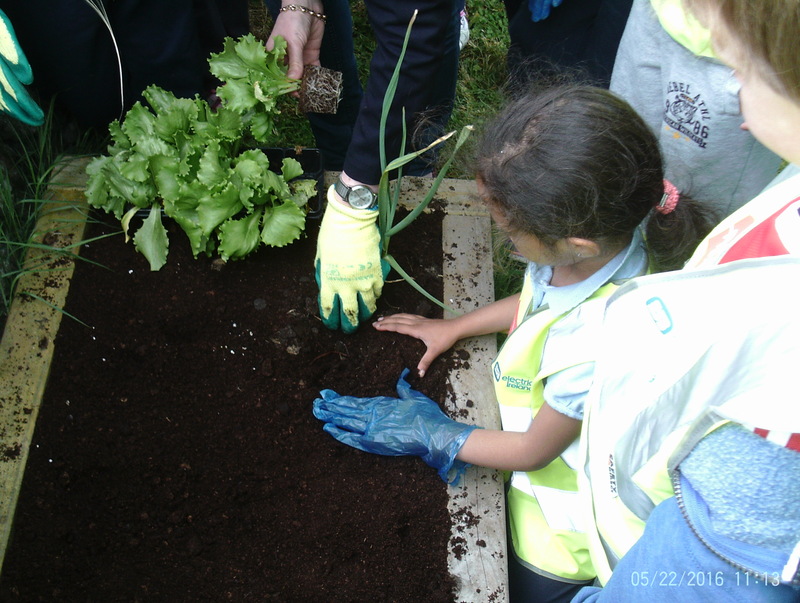 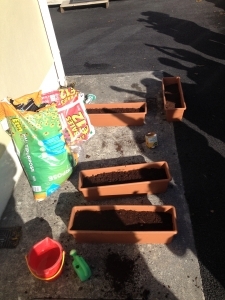 The children had lots of fun planting and are looking forward to watching them grow. 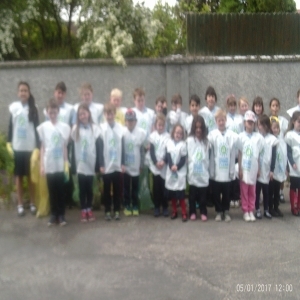 The children in Boston N.S. 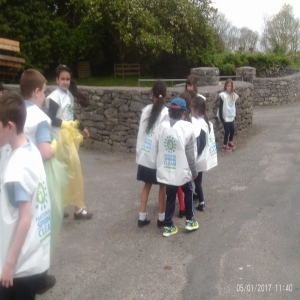 were busy cleaning up all the litter around the school grounds. 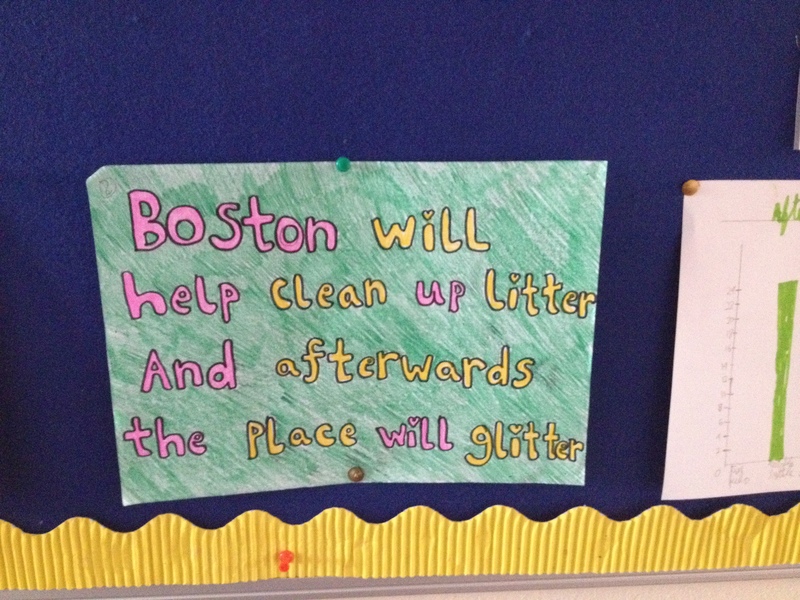 Boston N.S. 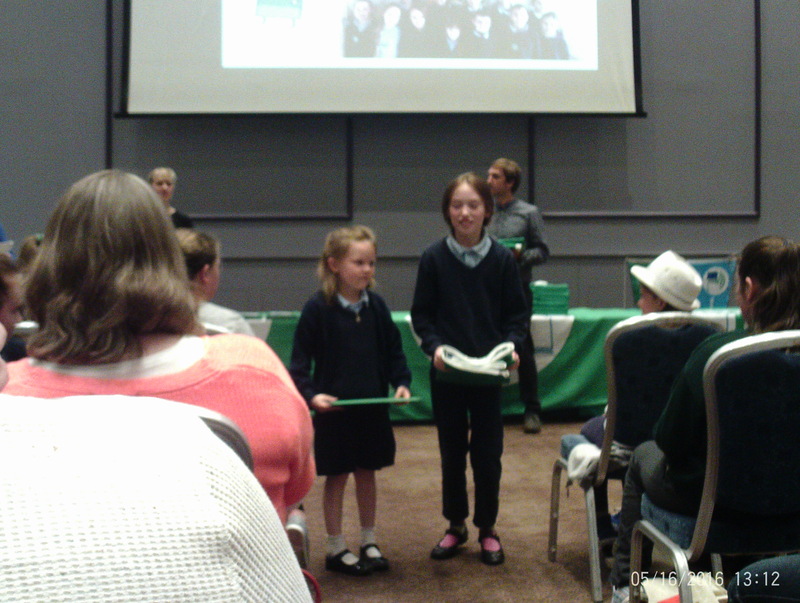 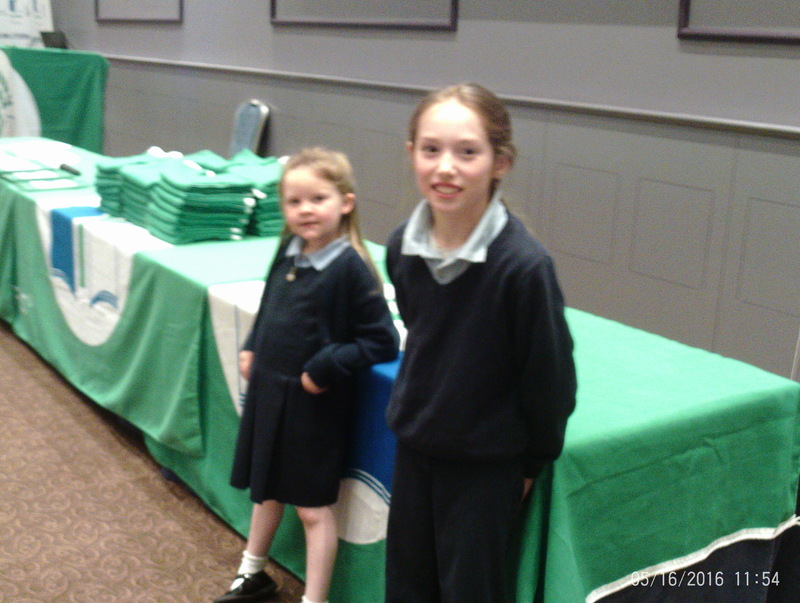 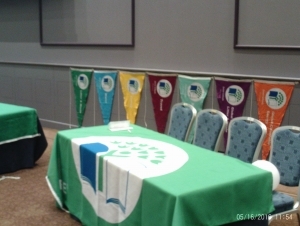 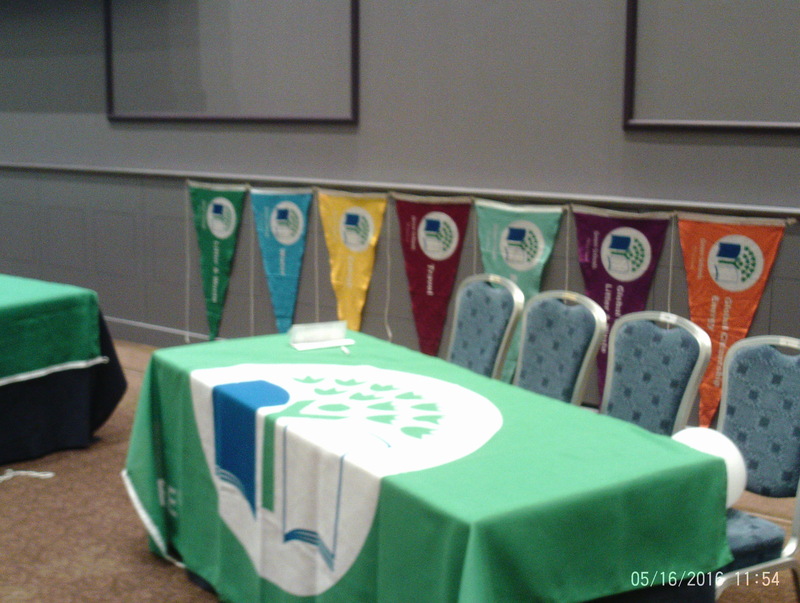 received their first Green School Flag this Thursday the 19th May. 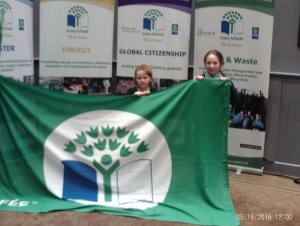 The children worked extremely hard and are delighted to have their First ever Green Flag. 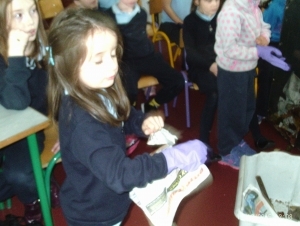 The whole school took part in our reusable art day. 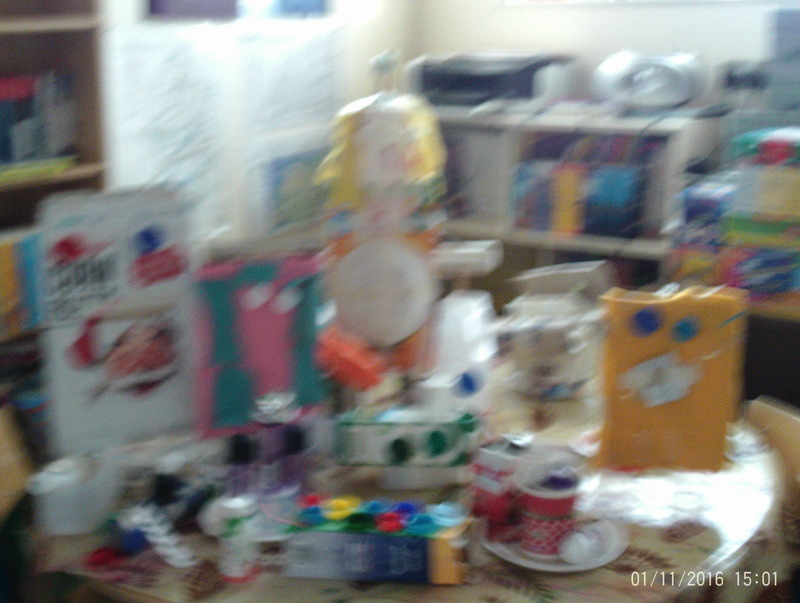 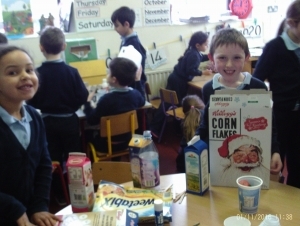 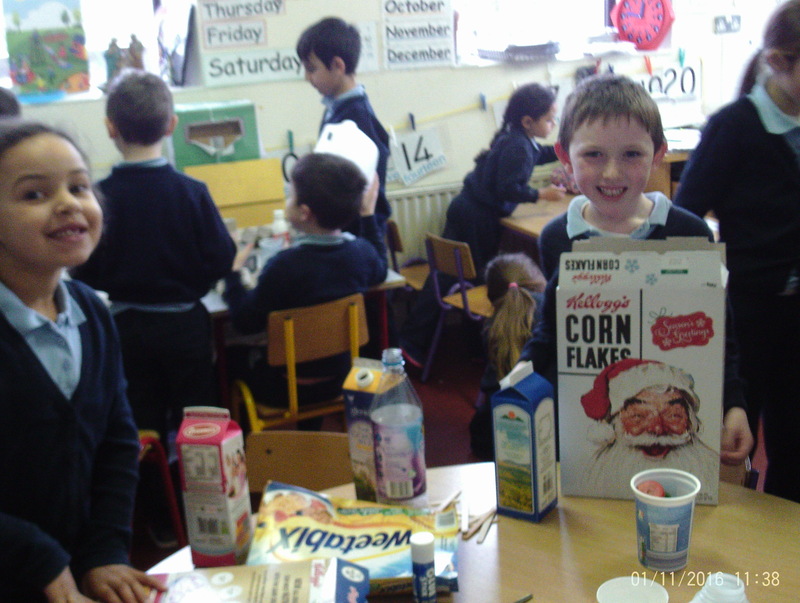 All the children brought in reusable materials they had at home and with the materials already in school such as yoghurt cartons, bottle tops, cardboard, milk cartons and much more the children had great fun doing art. Some of the items children made were robots, dogs, houses, cars, boats and much more. 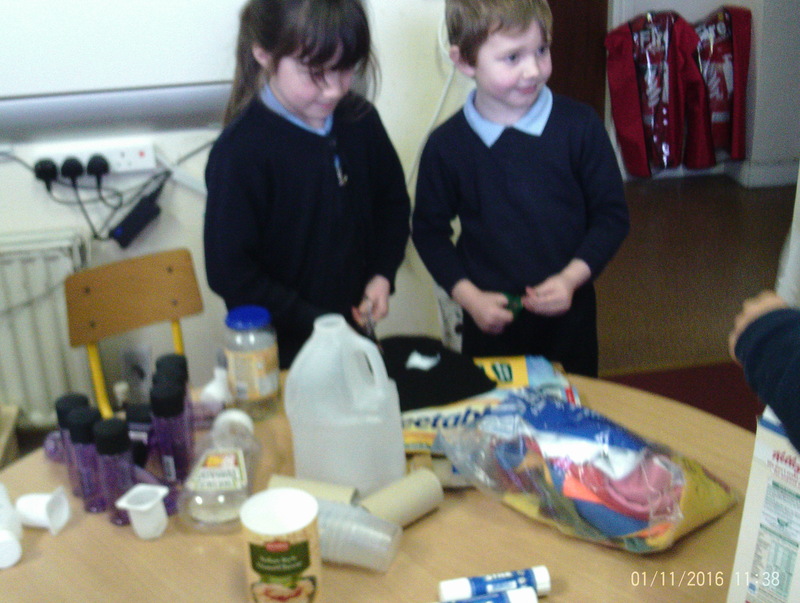 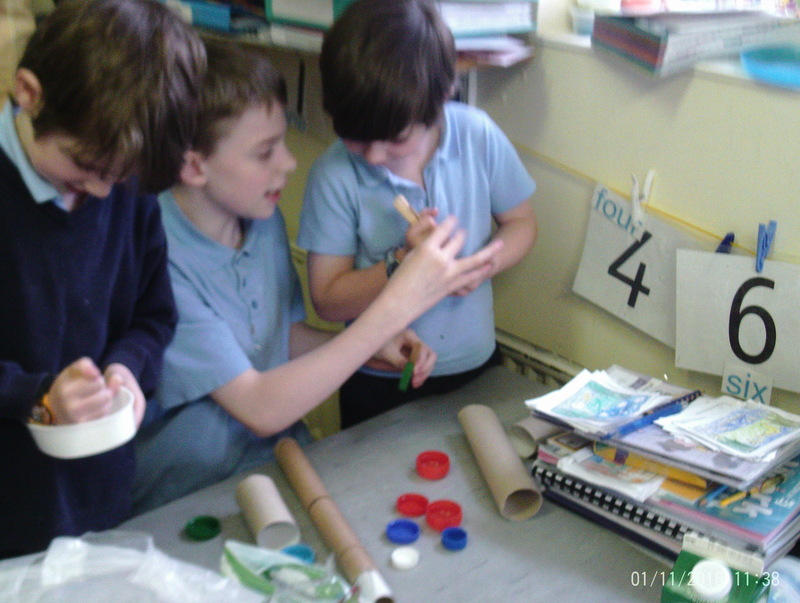 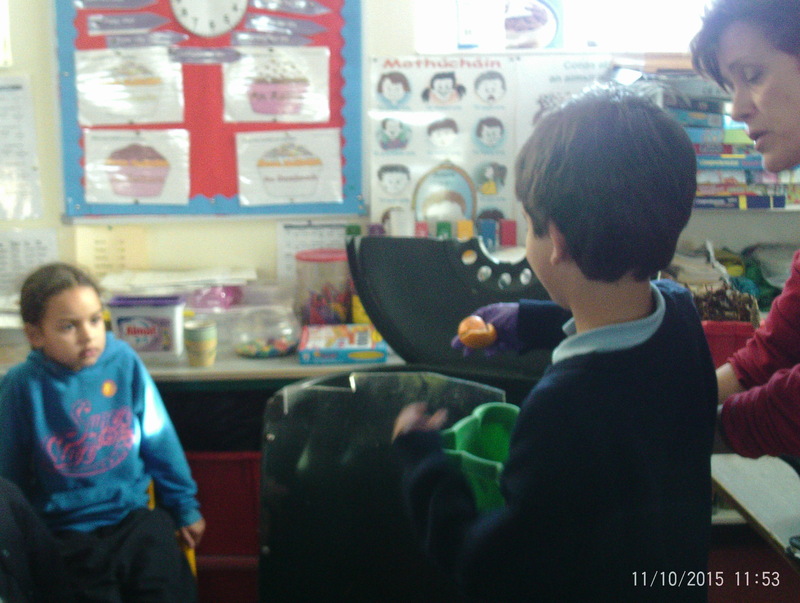 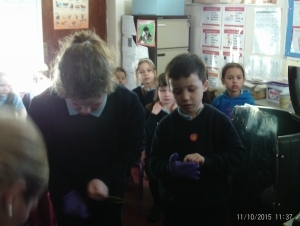 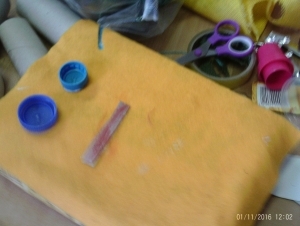 The children have also been busy making musical instruments out of reusable materials in the school. 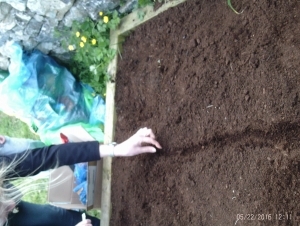 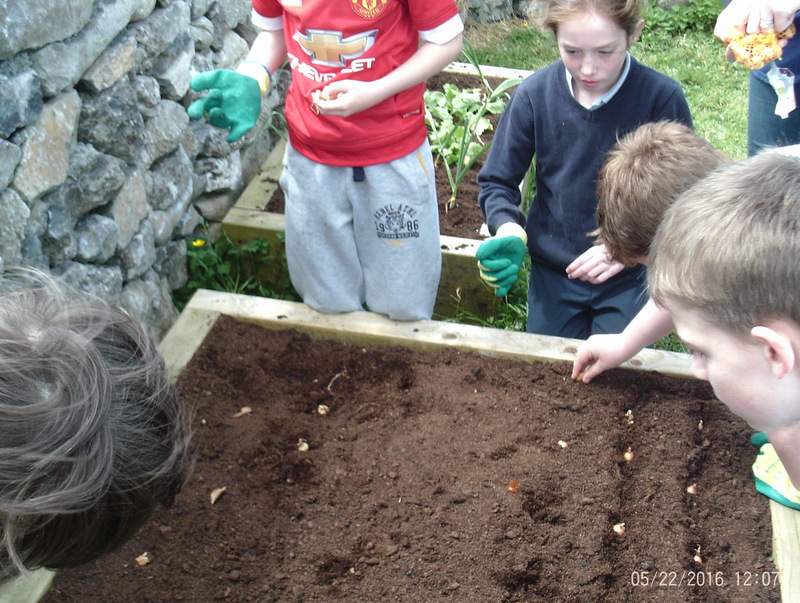 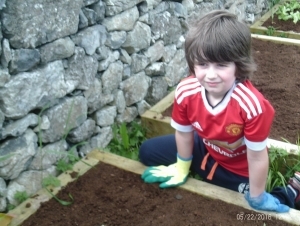 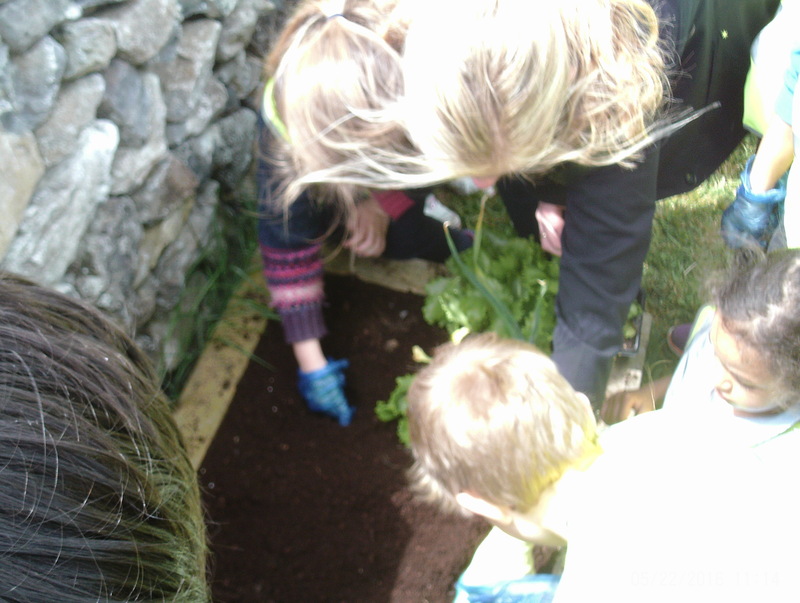 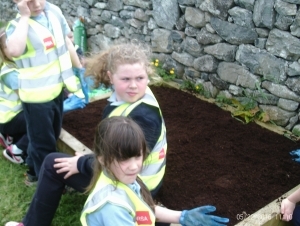 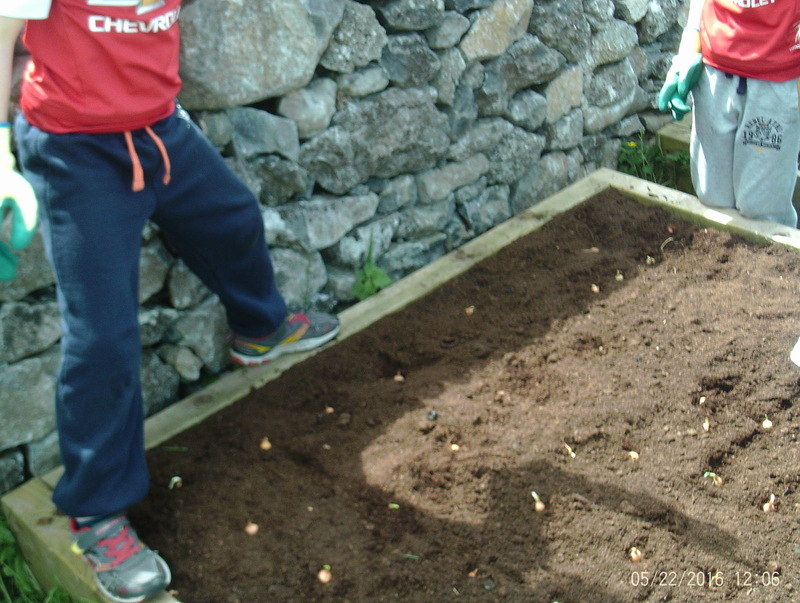 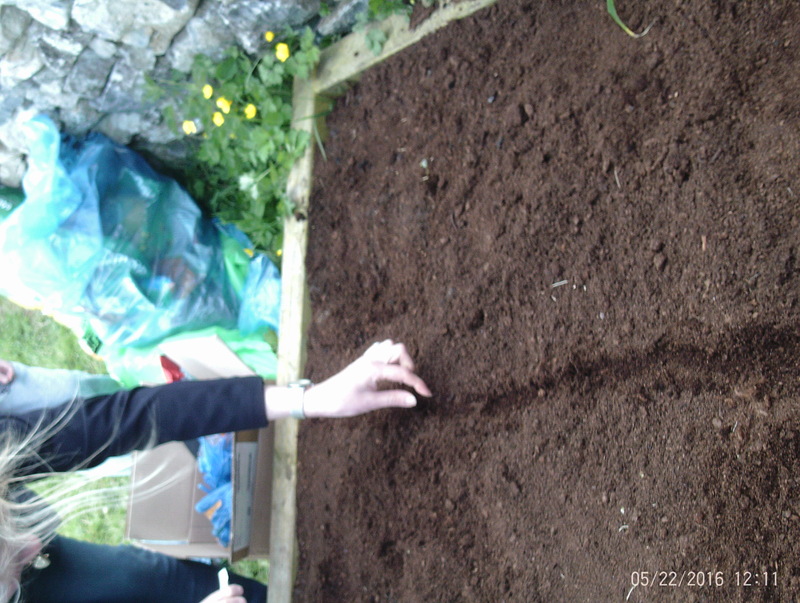 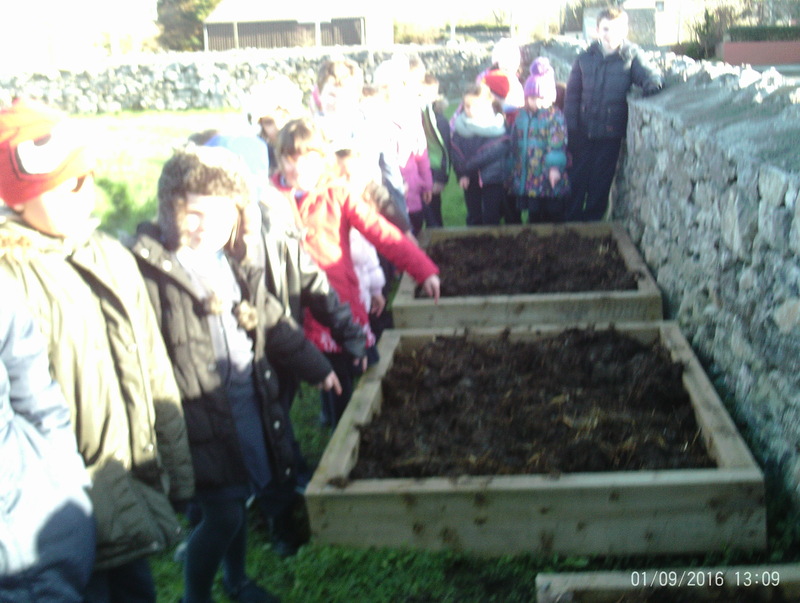 This week the children with the help of a parent and local farmer put manure in raised beds in preparation for planting vegetables later in Spring. This is part of our Green Code ‘To look after our world’. 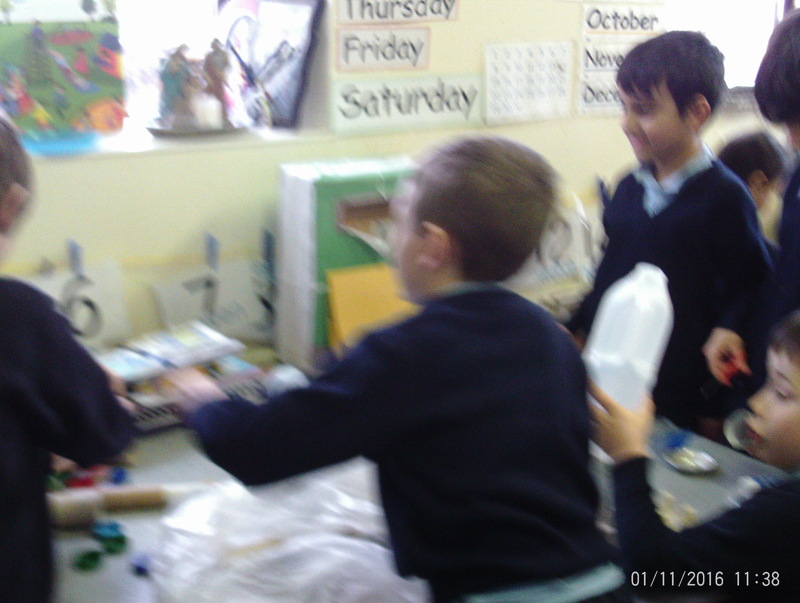 The children are working really hard and are coming up with great ideas in helping Boston N.S. 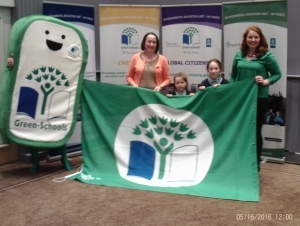 receive a Green Flag. 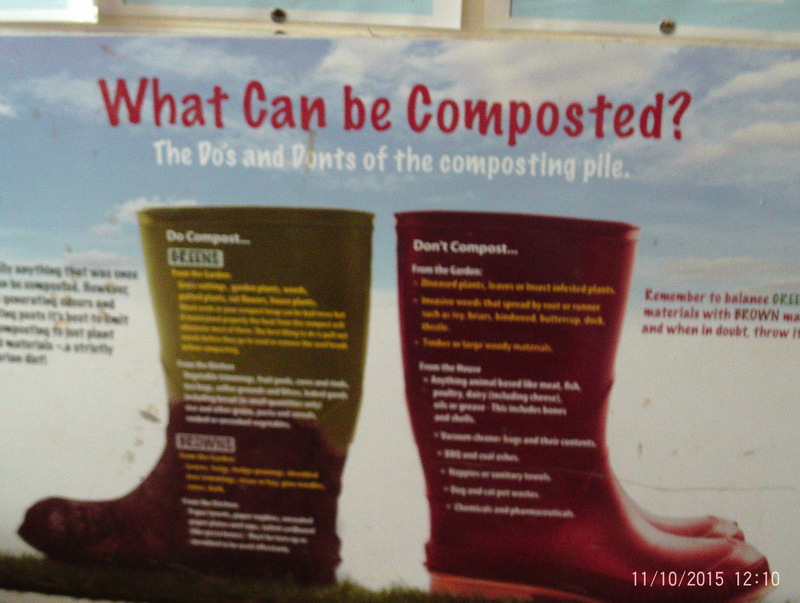 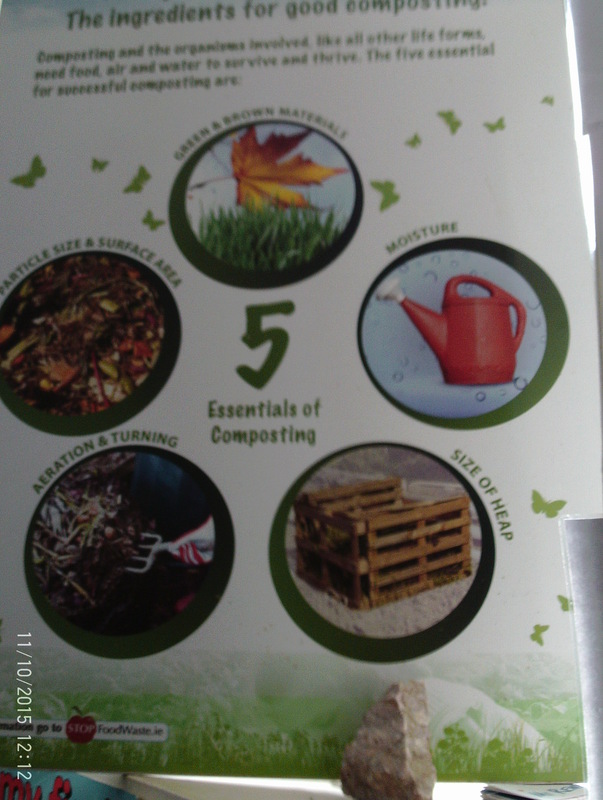 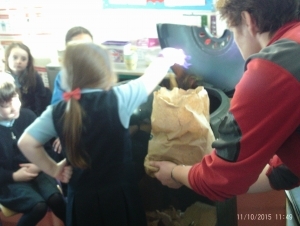 The students learned all about composting. 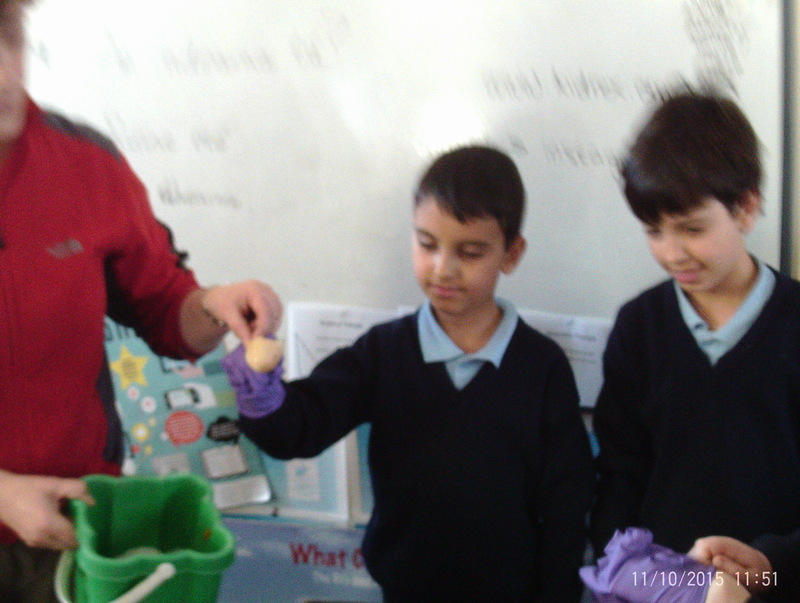 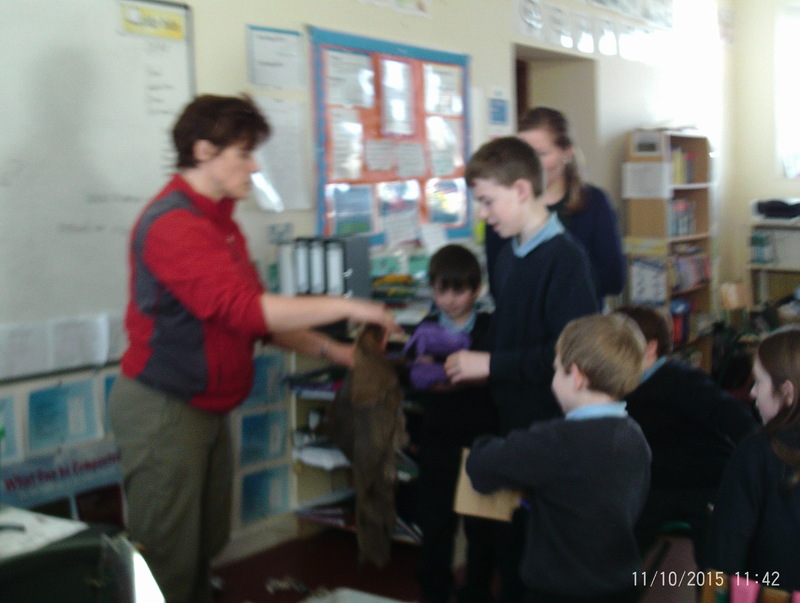 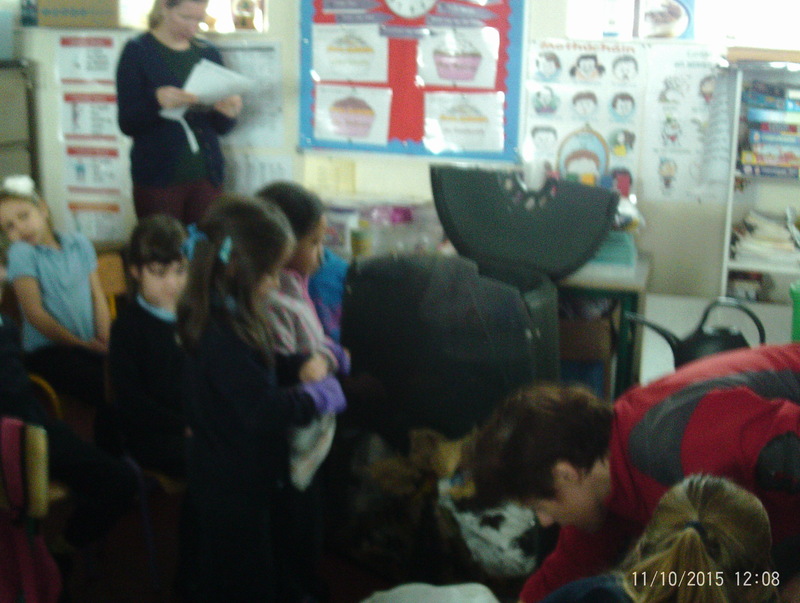 We were very lucky to have Joan come in and demonstrate how one would compost for example what can go into the compost, how much should go in and so on. 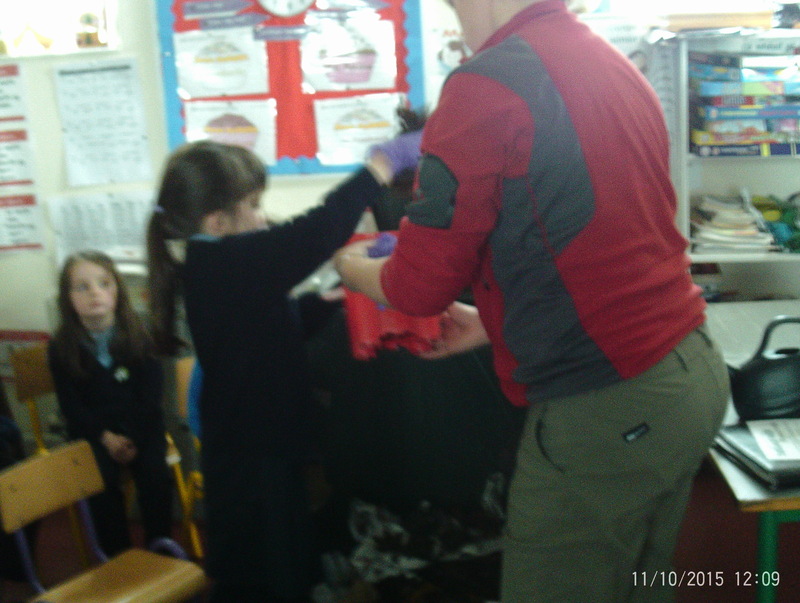 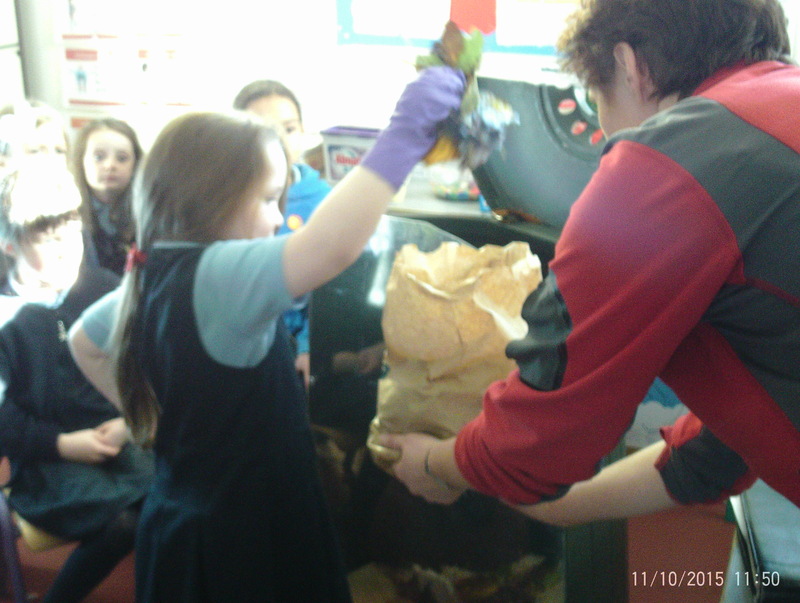 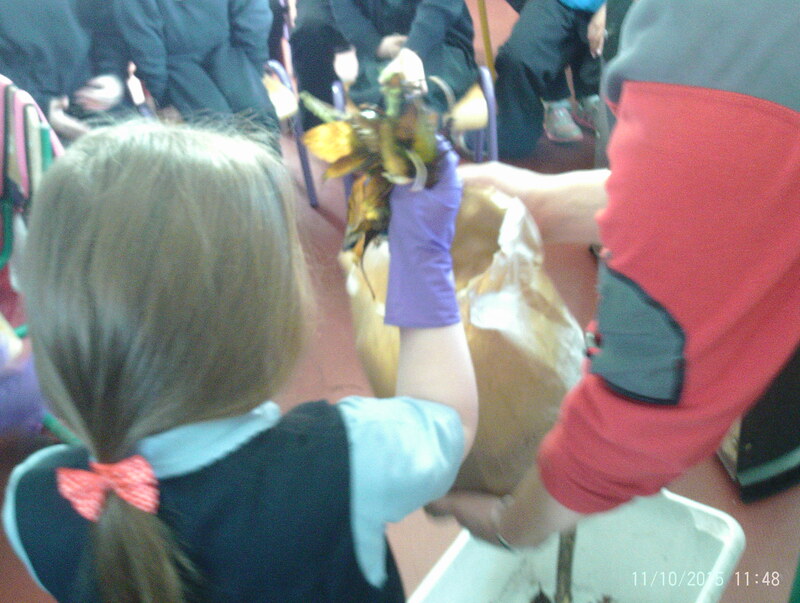 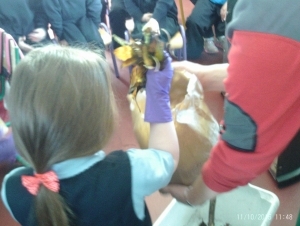 The children really enjoyed this and loved taking part in the demonstration. 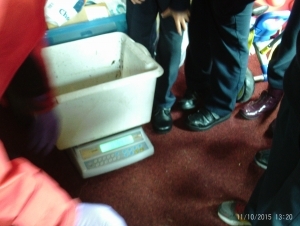 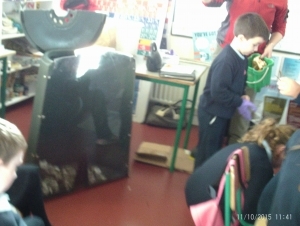 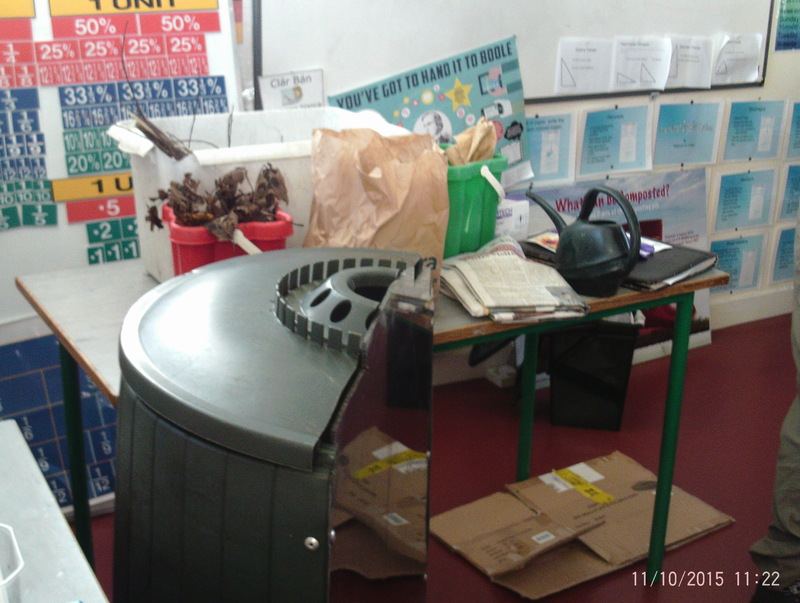 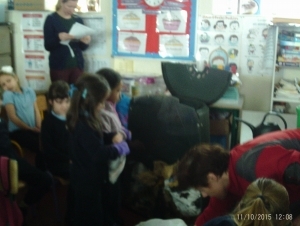 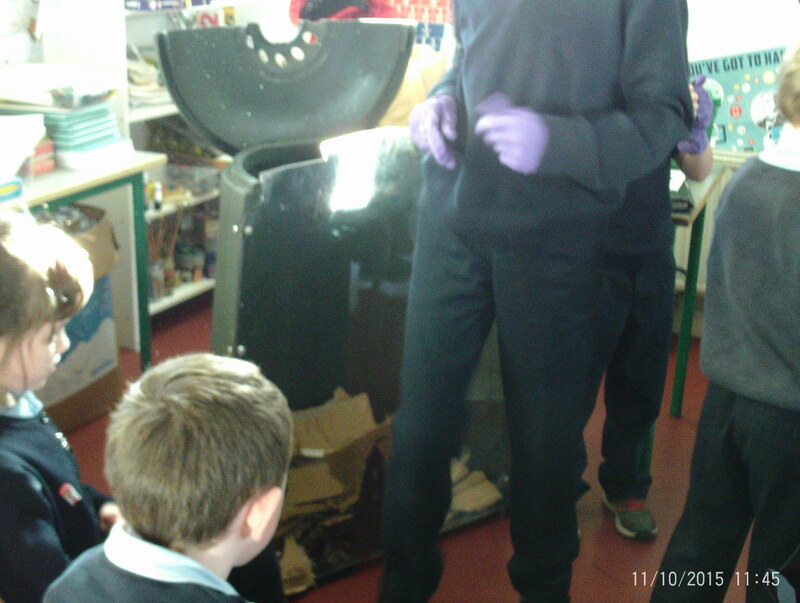 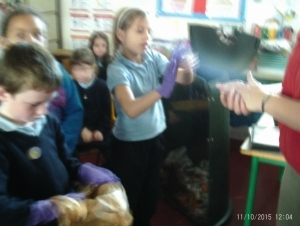 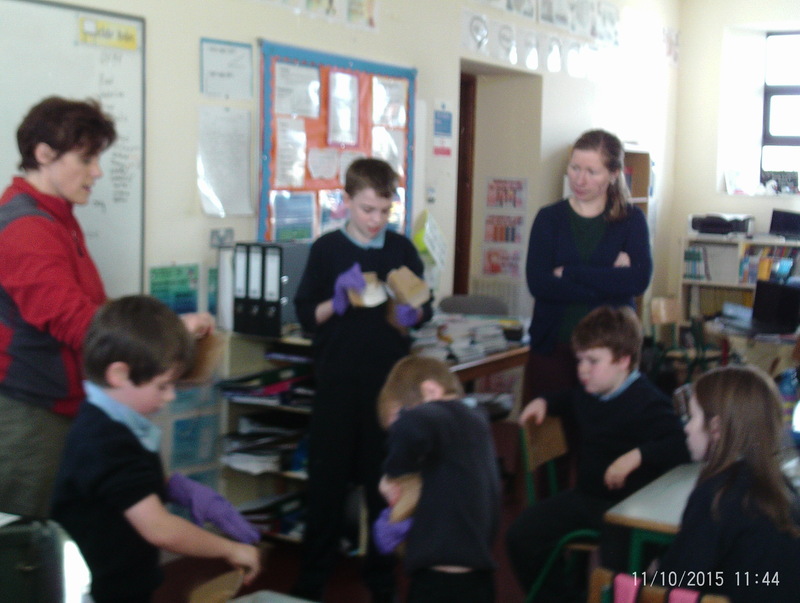 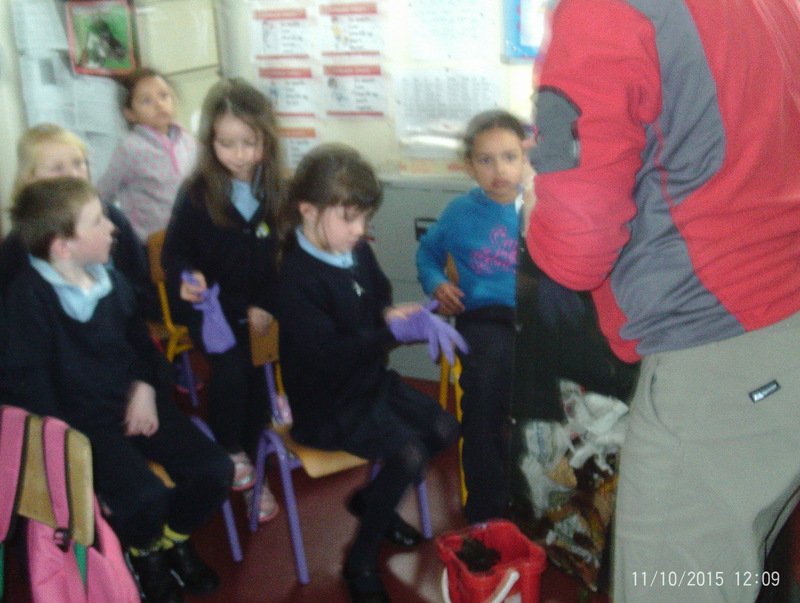 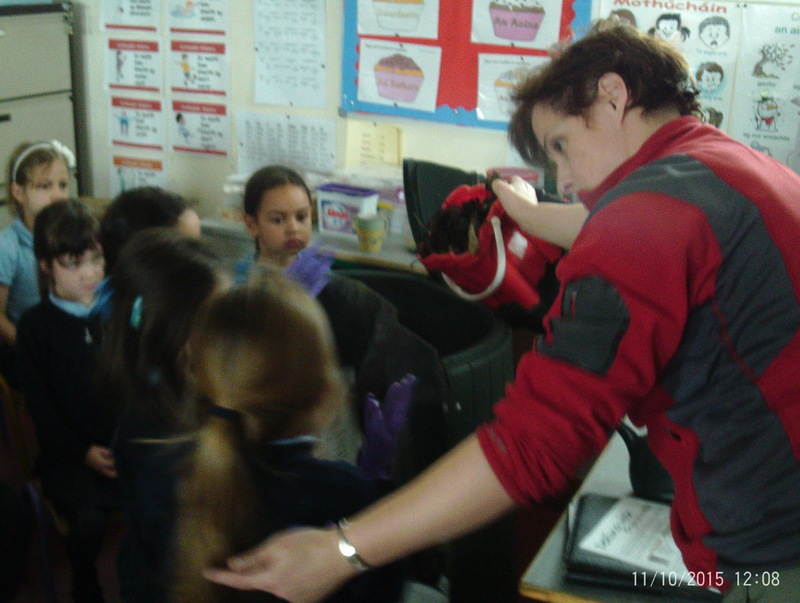 The students then with the help of Joan carried out a waste audit. They then made graphs and charts which are displayed on our Green School’s Noticeboard. We were re-using cartons to plant hazel nuts on World Tree Day 8th of October. 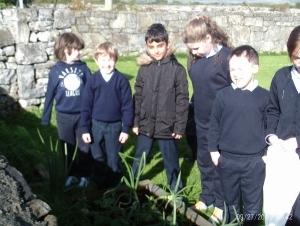 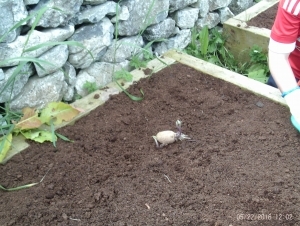 We planted crocus bulbs to remember those that died in WW2. 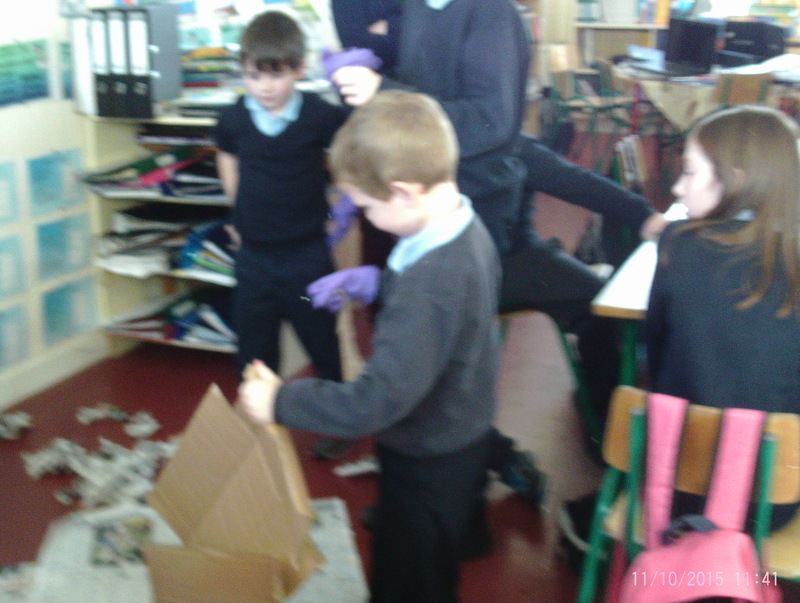 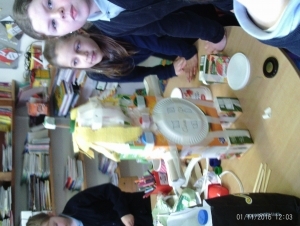 We used cardboard and cartons and lids to make robots. 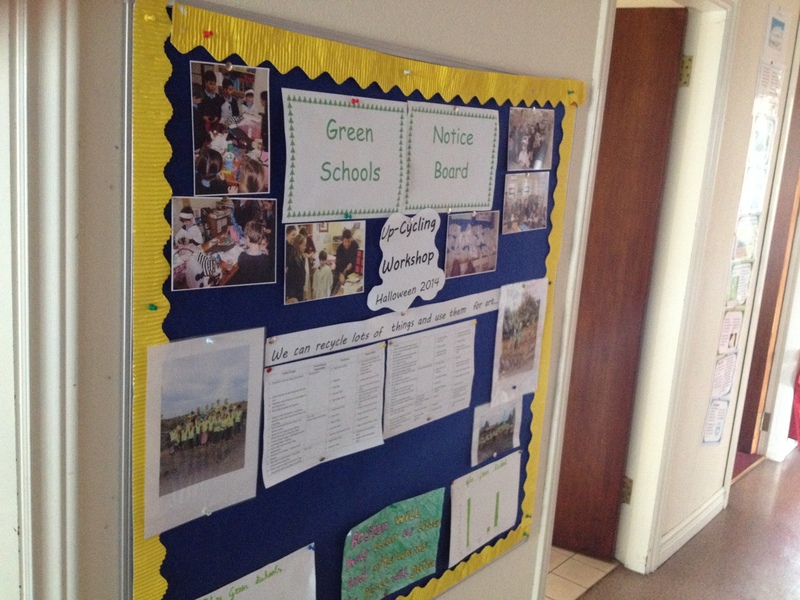 We Come and view our Green Schools notice board, as we continue to achieve our first Green Flag. 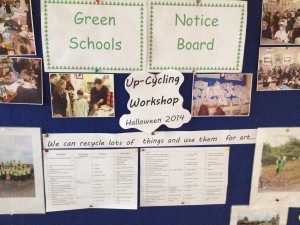 Come and view our Action Plan on the Green Schools notice board. 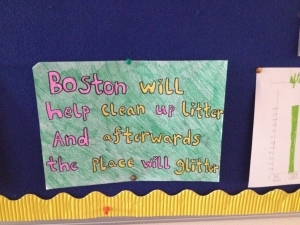 Boston N.S. began the process of achieving its first Green Flag for litter and re-cycling in 2014/2015. The whole school community has been involved in reducing landfill waste, using less paper and re-using paper, using lunch boxes and re-usable bottles. 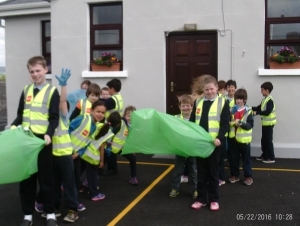 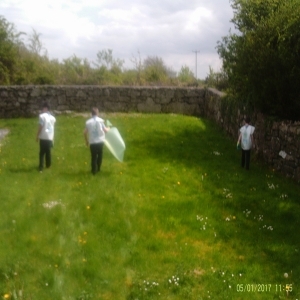 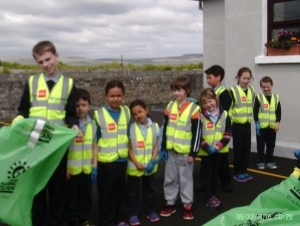 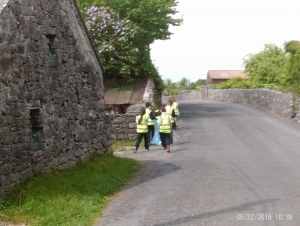 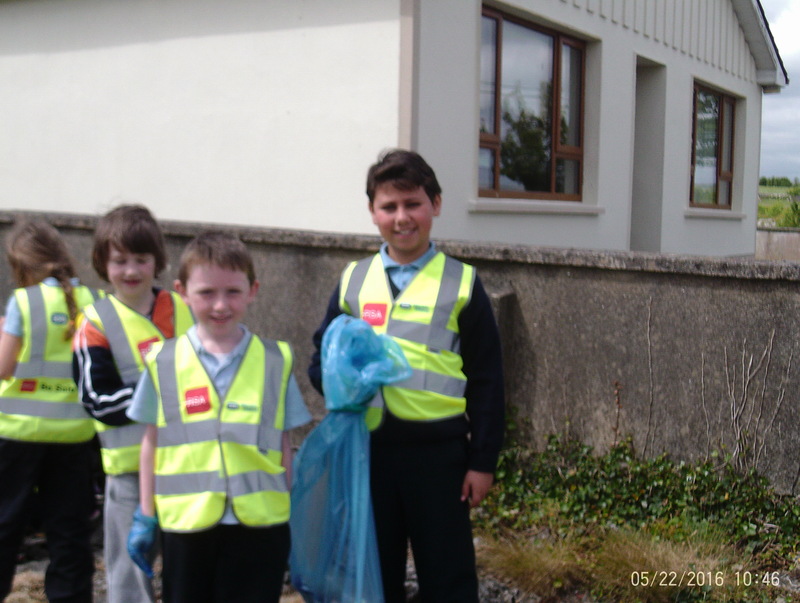 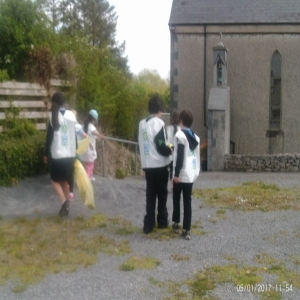 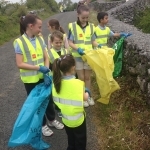 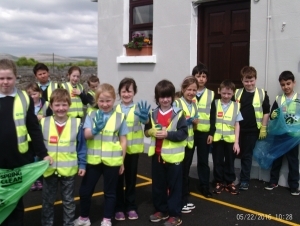 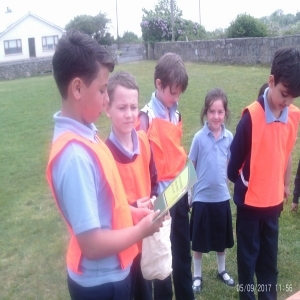 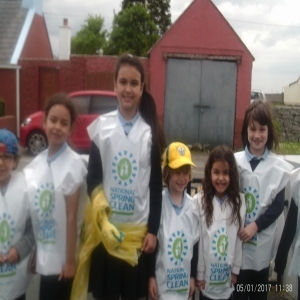 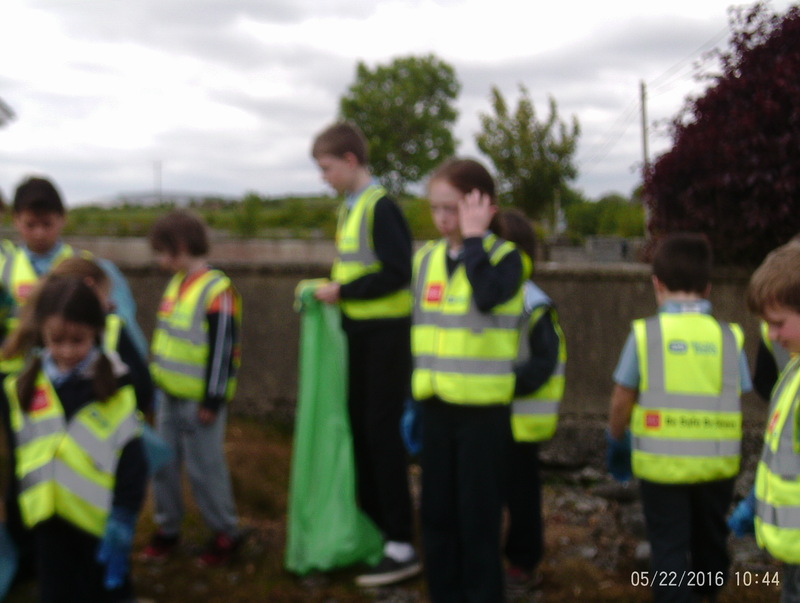 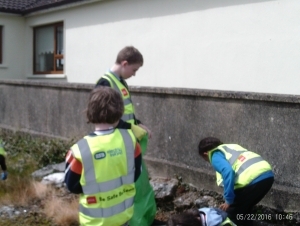 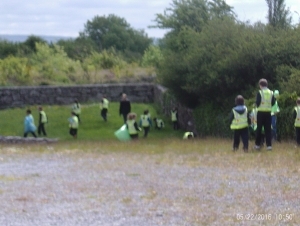 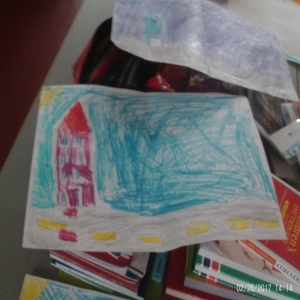 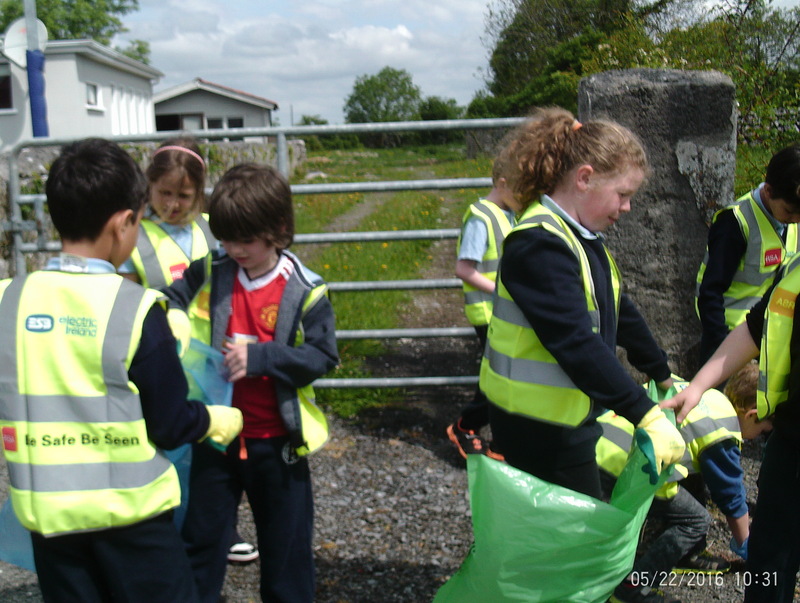 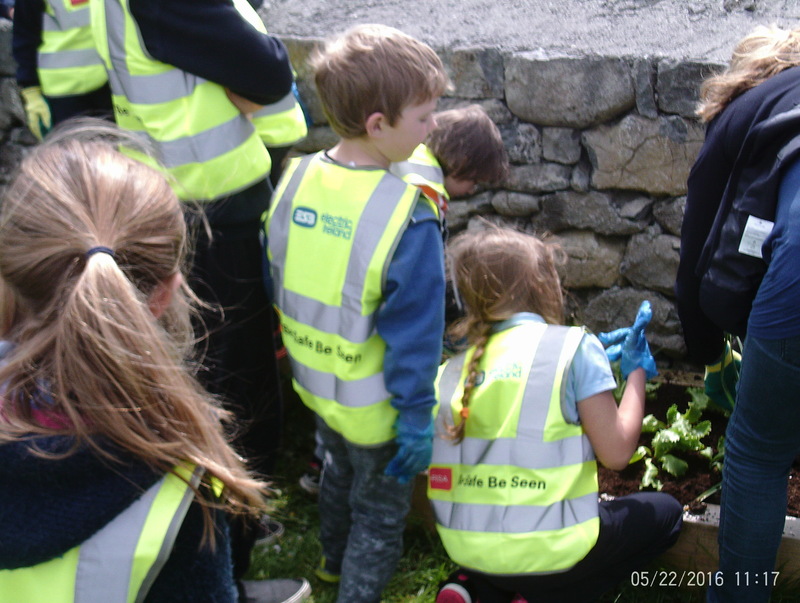 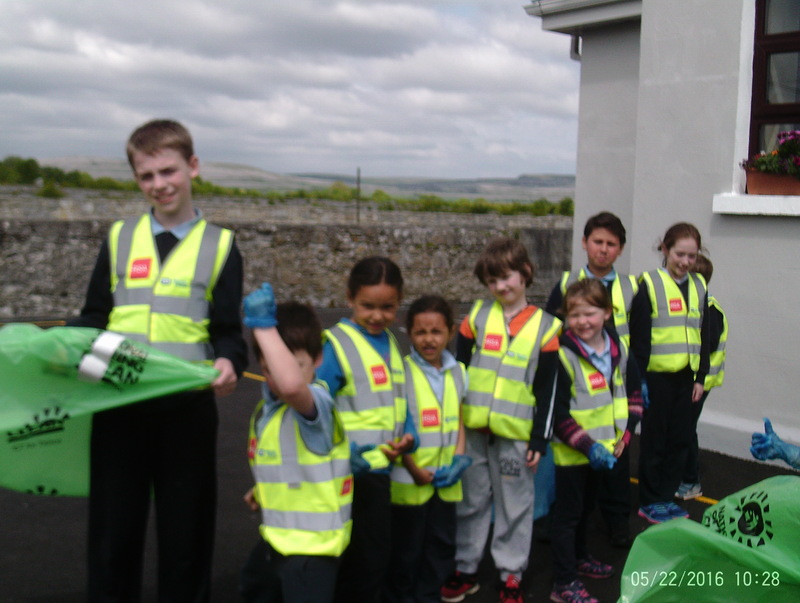 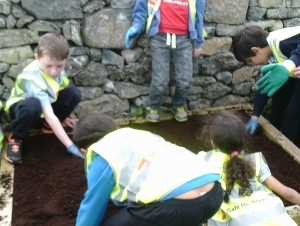 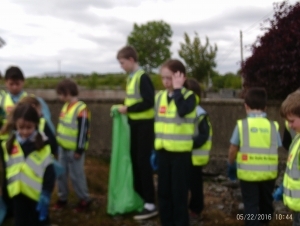 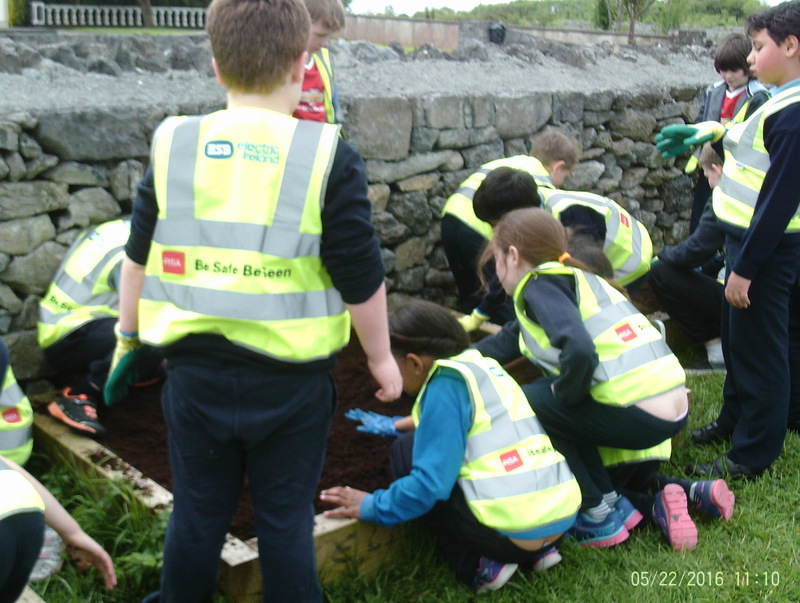 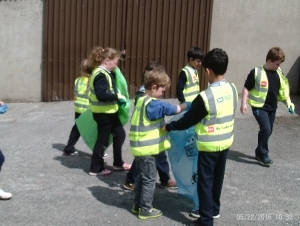 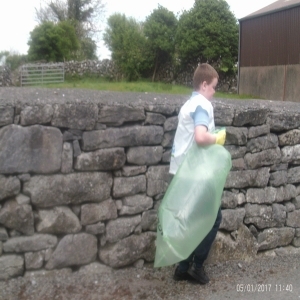 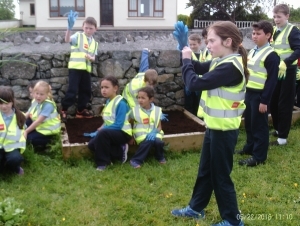 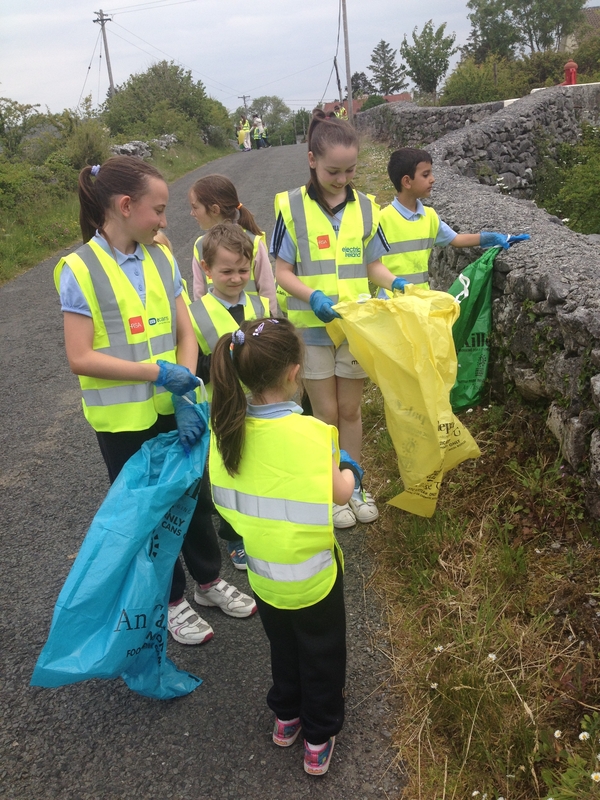 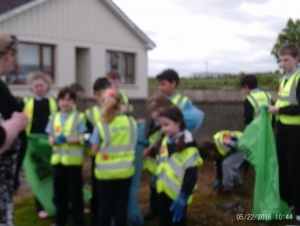 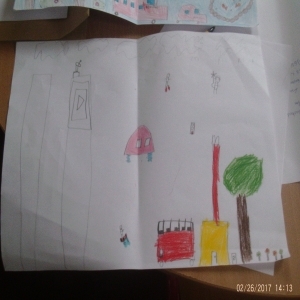 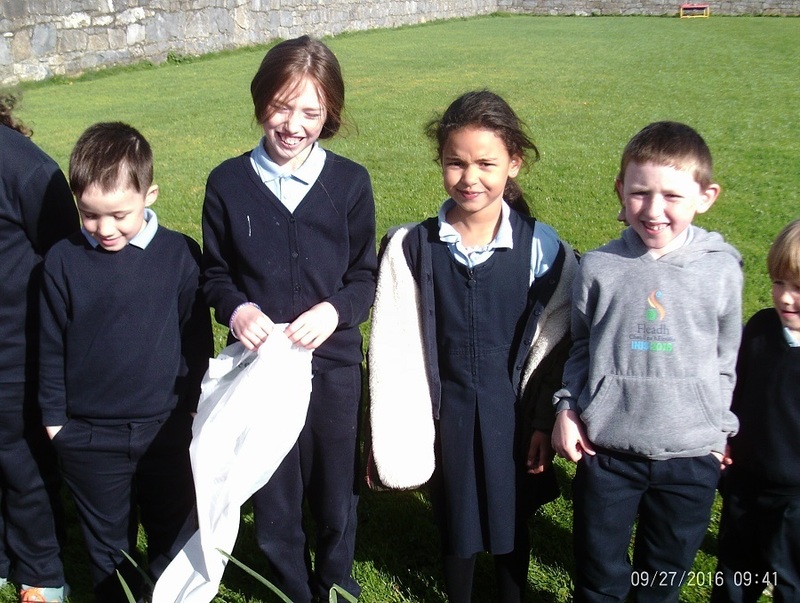 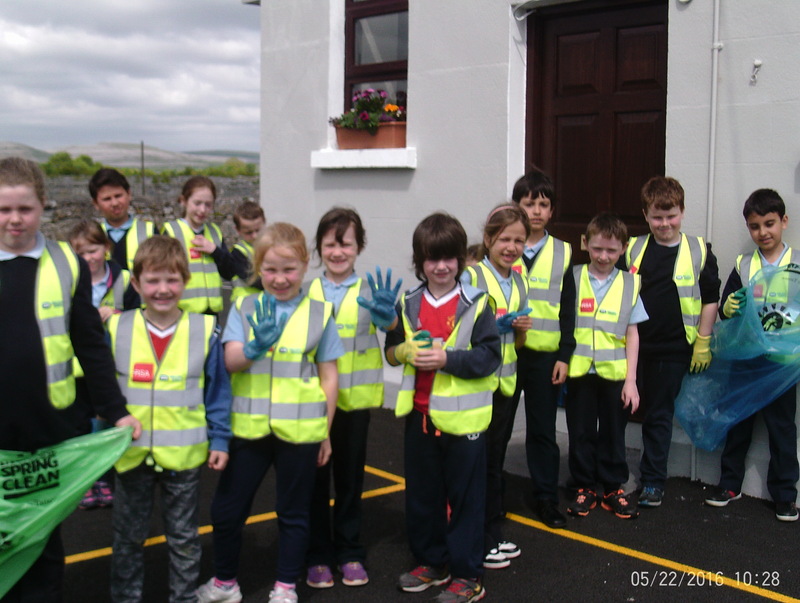 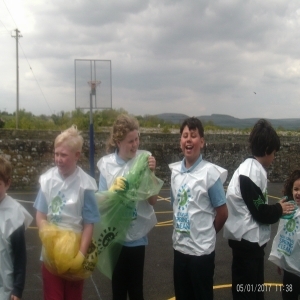 The children are very aware of keeping the school environment and local environment clean.The school had a clean up day on June 12th, the whole school community were involved. 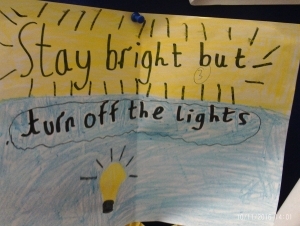 The school has developed an action plan. The children all had the opportunity to create their own slogan, they then voted in secret for their favourite slogan. The committee meet very regularly and the school has a Green Schools notice board in the corridor which is visible to all the school community and visitors.